I cannot believe that I have been home for over a month. There are still many days when I wake up and have to quickly remind myself that I am no longer in Spain and many times throughout the day that I think of Sevilla and the great memories that I made during my time there. The Spanish American Institute, the program that I studied with during my time in Spain, recently released this video that we worked on a few weeks in to my stay in Sevilla. 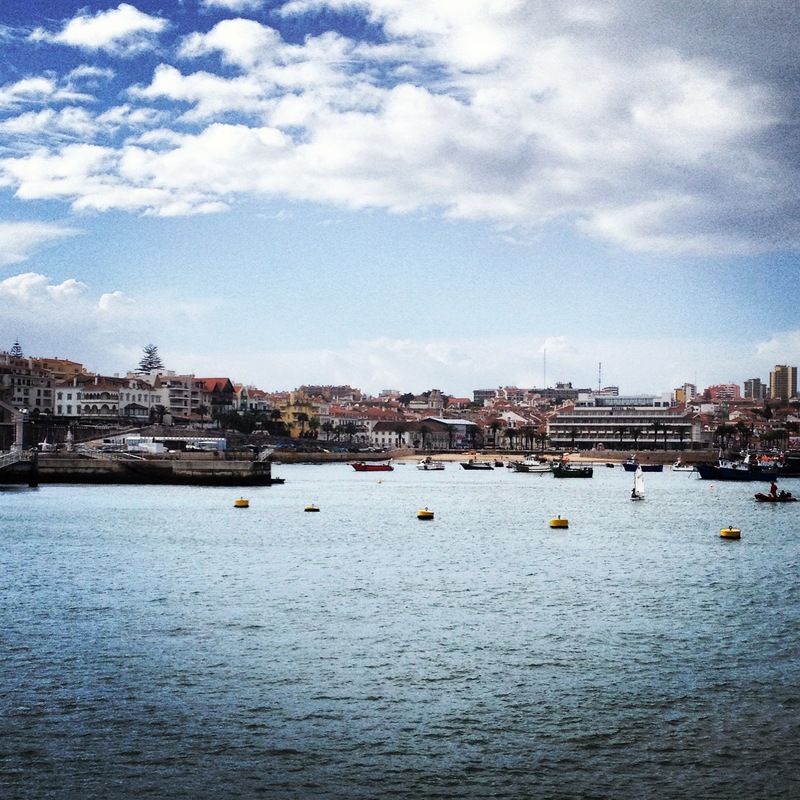 I thought it would be neat to share it with you as it provides a neat glance of my Spanish host-family experience. 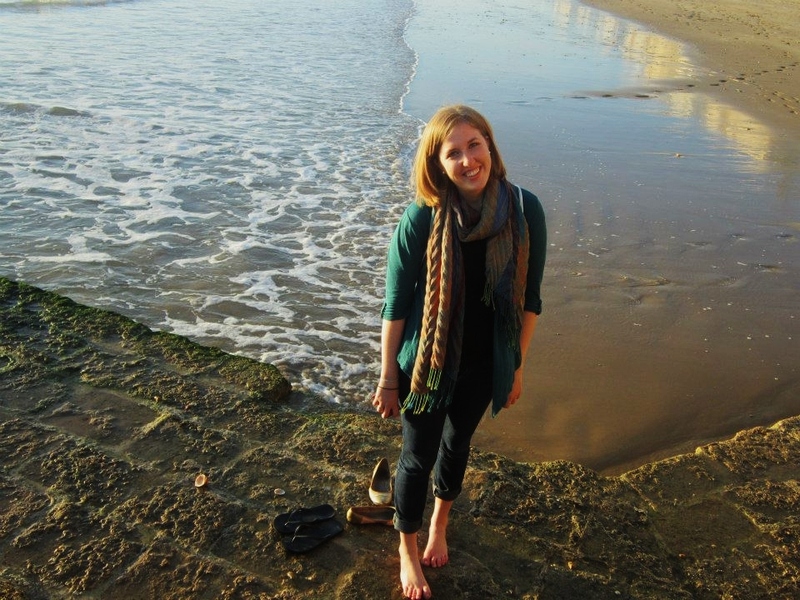 In the video you will see Courtney (my amazing roommate that I miss VERY much!) and Charo, my Spanish host mom. On this particular day we were celebrating Courtney’s 23rd birthday. The meal included a very traditional dish called Paella (rice, vegetables and seafood… Charo makes the best paella!) and you will also see a very typical “tapa” (small portion of a bigger meal) called croquetas (they happened to be a favorite of Courtney and I). I hope the video makes you smile and gives a neat inside look into my Spanish home-stay experience! By now many of you know that I have successfully made the trip home to the States, but my heart is still very much in the city of Sevilla! 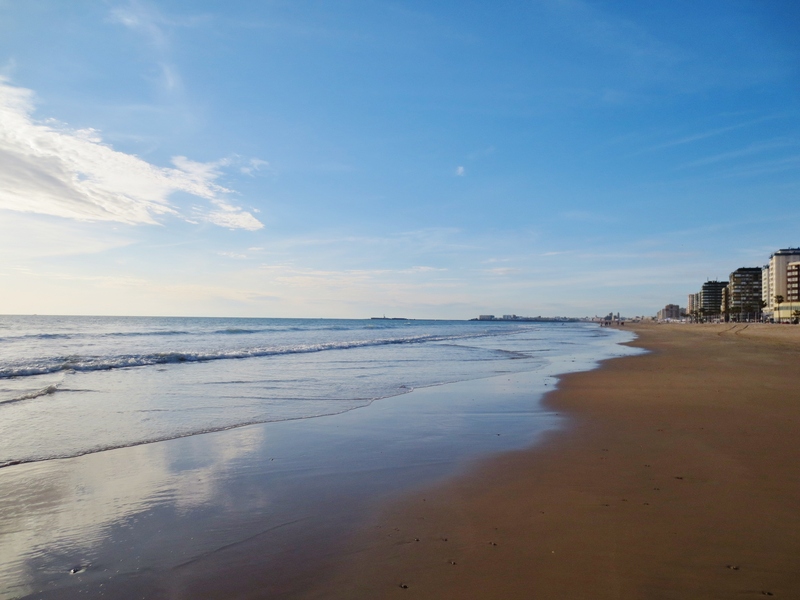 I still have two posts that I was hoping to write before I left Spain, but we were all too busy soaking up our last few days together in the city. April 14-21 marked the week of “La Feria” (or translated into English “fair”) for the city of Sevilla. 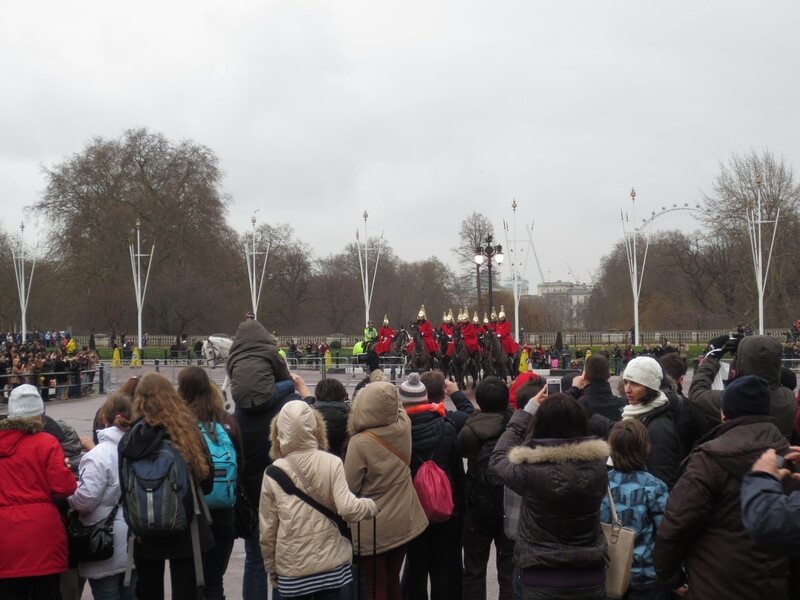 We had off school the entire week for the celebration, and many of the students took advantage of the time and traveled to various parts of Europe. 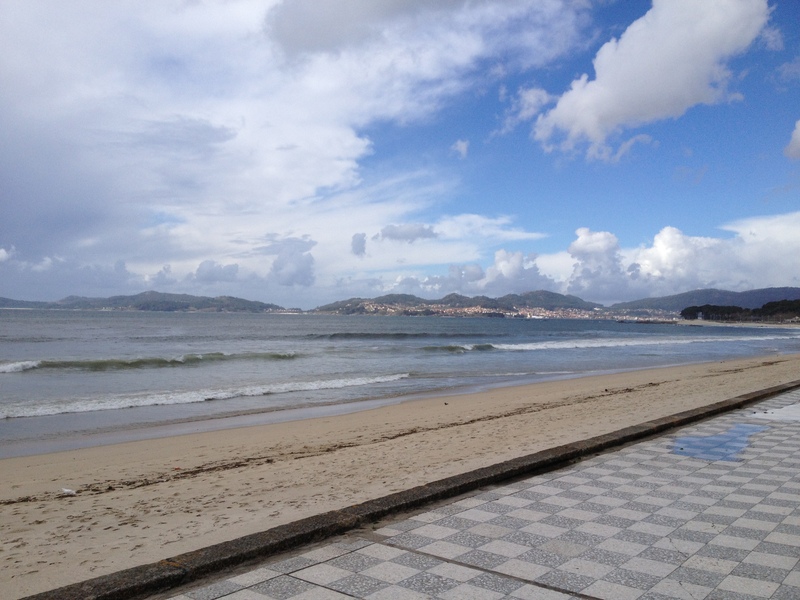 I decided once again to go to Vigo and spend the week with Marcela’s family. I stayed with Veronica, Marcela’s youngest sister, and her two children Angel and Jessi for the week in Pontevedra. Little did I know what an amazing week I had ahead of me. Friday night Jessi and I went to spend the night at Vivi and Paco’s house in Vigo. The following Saturday we drove to Portugal where we had a picnic lunch and explored a local market that they have each week on Saturday’s. Before crossing back in to Spain, we drove up a huge mountain (and of course the name is escaping me right now) with a view of both Spain and Portugal, and straight ahead was the Atlantic Ocean. It was breathtaking and such a perfect way to spend one of my final days with them. In the evening Jessi and I took the train from Vigo back to Pontevedra (she was very excited to take a foreigner on the train all by herself J ) and we watched the sunset over the water. Veronica picked us up at the train station. Sunday morning they drove me to the airport in Santiago and after a very tearful goodbye, I boarded the plane back to Sevilla. Spain is to the right, Portugal is to the left. 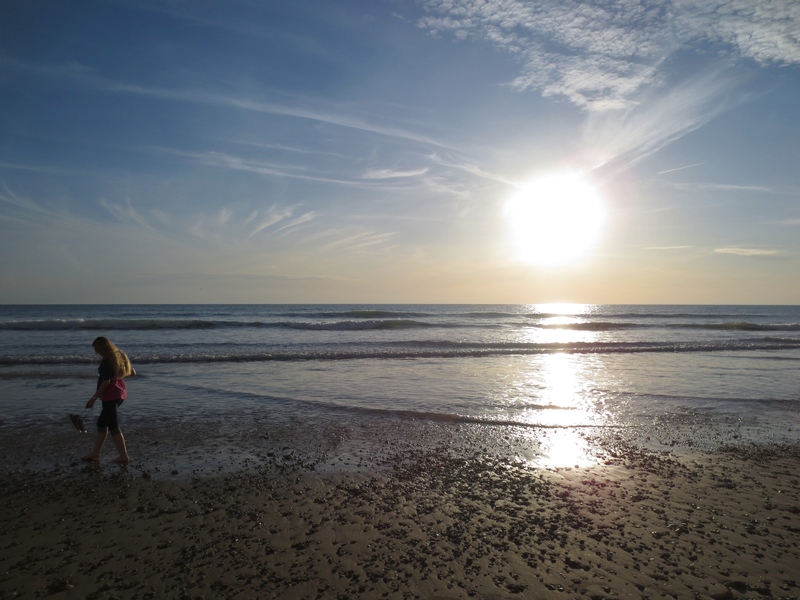 Atlantic straight ahead. 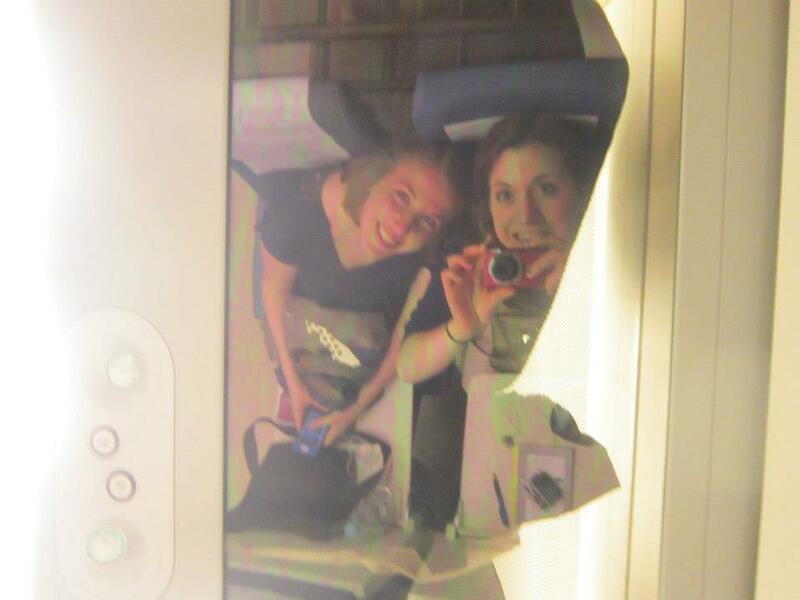 Jessi and I on the train! The highlight of the entire week for me was all the time that I was able to spend with Veronica. We would stay up til 1 or 2am each night just talking with each other and eating “cosas ricas” (rich things!). She was so patient with my Spanish and was constantly encouraging me to chase after my dreams and be confident in the person who God has created me to be. I don’t know if she will ever know what an impact she had on my life in those short two weeks that I was with her and I will never know how to thank her for everything! Since the trip, we have been texting each other every day, and I am thankful for the chance to practice my Spanish on a regular basis! I returned home on Sunday, the last day of Feria, and Courtney and I dressed up and explored Feria for the final evening with some good friends from school. I was happy we were able to experience it, even if it was for such a short time. At midnight they had fireworks to close out the week long feria celebration. It was a great ending to a great week!! I’m worth how many camels? 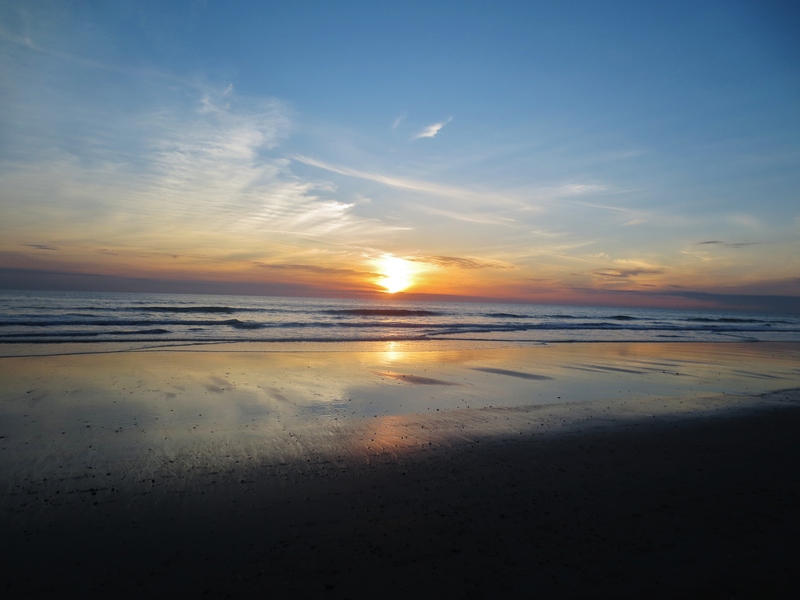 I apologize for being so sporadic with my blog posts! My time in Sevilla is quickly coming to an end (5 days left in fact…) and we have been taking every chance to soak up as much of the city as possible before we head back to the States. This weekend was full of gelato, soaking up the sun by the river, enjoying tapas and Sevilla’s famous “Cruzcampo” and some tinto de verano, but most importantly spending time with some pretty awesome friends. 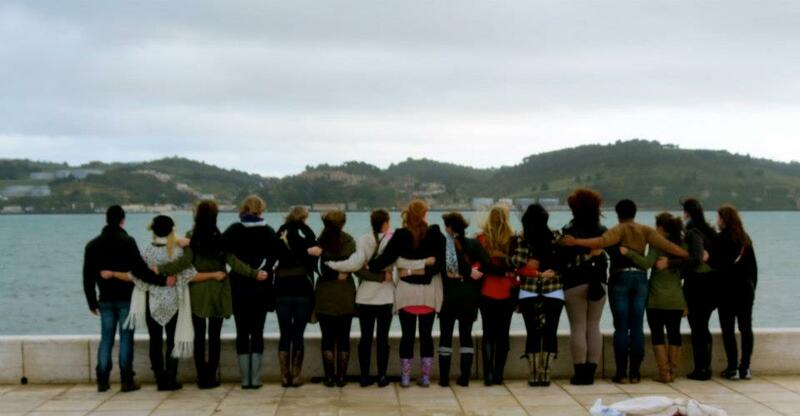 It is going to be so hard to say goodbye to my fellow friends/classmates in just a few short days! At the beginning of the month we had the opportunity to travel to Morocco, Africa with all of the students from our program. 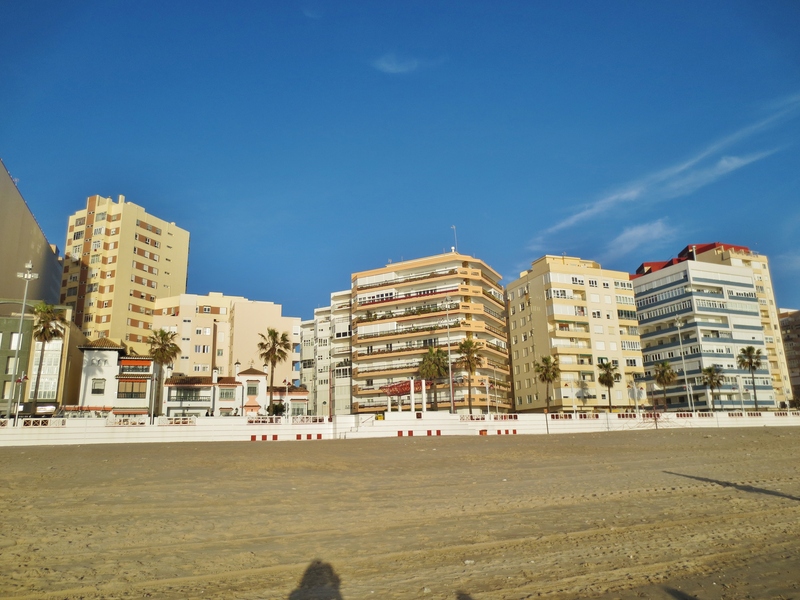 It was by far one of my favorite trips, and definitely involved a bit of “culture shock” in comparison to the other countries and cities that I have visited during my time in Spain. 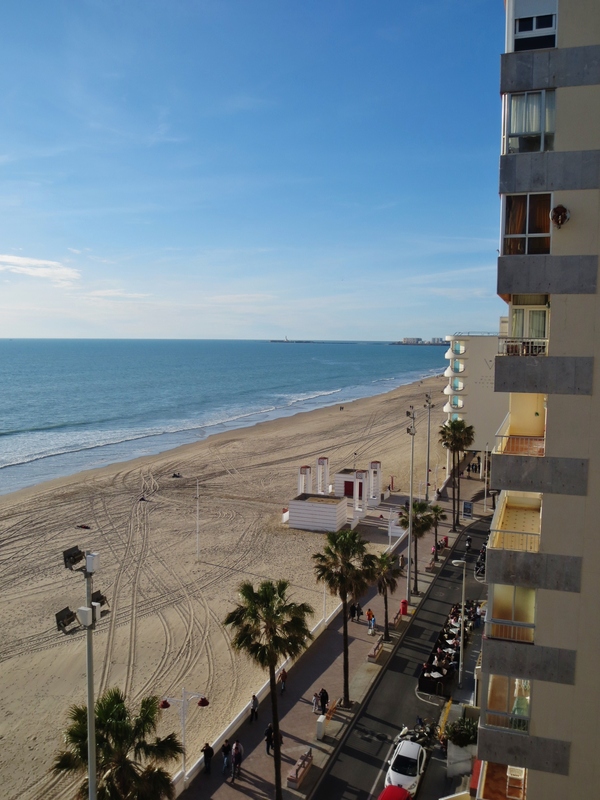 Friday April 5 – We left Sevilla by bus around nine in the morning and drove two hours to the coast of Spain to a city called Tarifa. 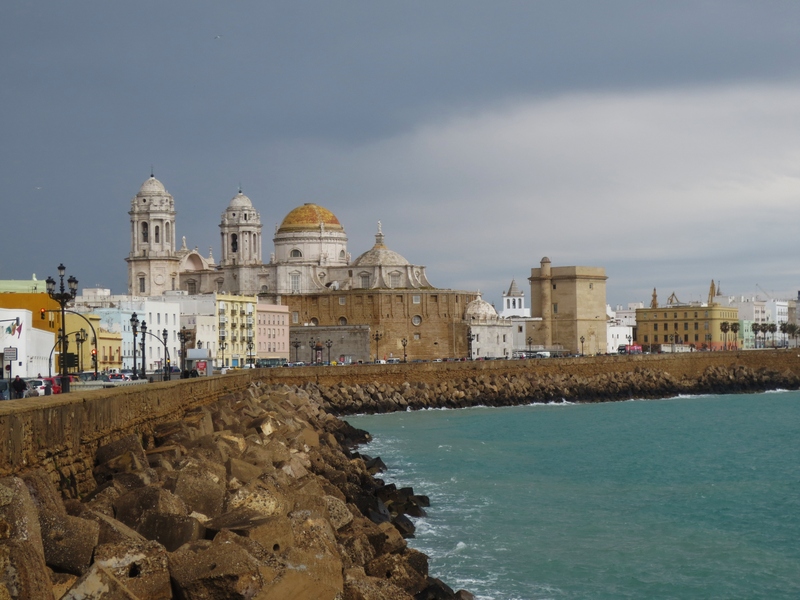 From Tarifa, we took an hour ferry ride across the Strait of Gibraltar to arrive in Tanger, a port city on the coast of Morocco. The ferry ride was quite an experience as it was my first time being on a boat for that “long” and the weather was not the greatest, creating a very rocky and difficult hour on the boat. Thankfully some friends and I found the observation deck so that we could get some fresh air outside and enjoy some of the beautiful views from the ferry. 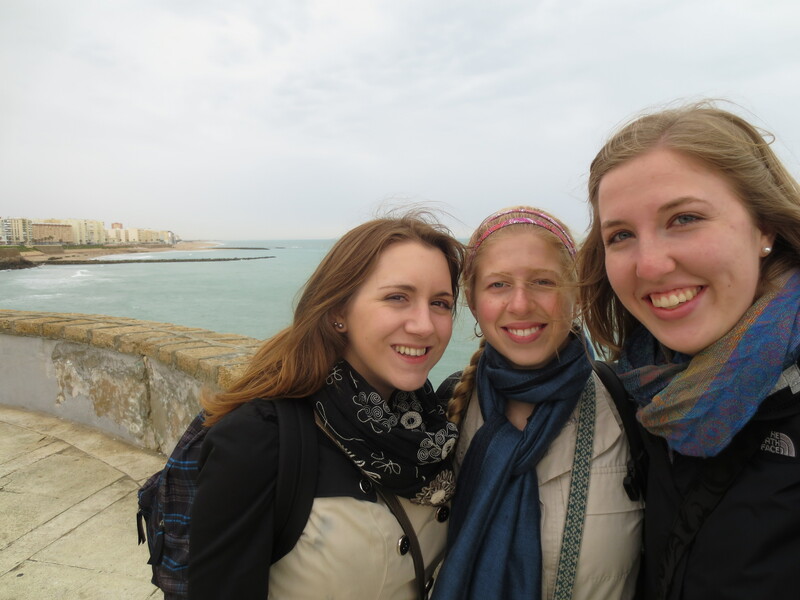 After our arrival in Tanger, we boarded a bus that took us to the center of the city where we began a short walking tour. It was so interesting to see so many of the women in the traditional head covering. As a tall, blond American, I was very out of place! At times it was a little uncomfortable, but it most definitely made me appreciate my country and the freedoms that I have as a woman. We did find out that Courtney was valued at 600 camels… at first we were disturbed, but it sure did make us laugh later! We ate a delicious lunch at a local restaurant that also featured live music and a belly dancer. The food was delicious (couscous and mint tea were my favorites!) and we laughed as the belly dancer forced Courtney out of her seat to dance with her for a few moments. Morocco is known for their spices and local remedies and we had the opportunity to learn about and purchase some of the most popular items after lunch. I am excited to share some of the delicious tea that we enjoyed while I was there with family and friends when I get home! 🙂 Once we arrived at the hotel on Friday, we were in for the night. We ate dinner together as a group and enjoyed spending time with each other in the hotel. Saturday April 6 – The next morning we woke up and boarded a bus to travel to the beautiful city of Chefchaouen in the mountains of Morocco. This was by far my favorite part of our Morocco trip. According to our local tour guide, the majority of the city is painted blue to “keep out evil spirits and the bugs.” He had to be at least eighty years old and so soft spoken we could barely hear him (see picture below!). We enjoyed walking around the city and taking an excessive amount of “blue door” pictures, as well as learning how to barter with the locals to buy some beautiful scarves, blankets and jewelry. We boarded the bus to drive the two hours back to Tanger to our hotel for the evening. On our bus ride home, one of the guys from our group put on “Waka Waka” and we all laughed, sang and danced to the song as we drove through the countryside of Morocco. Saturday night was by far one of my favorite nights of the trip. We all ended up in one of the hotel rooms with a deck of cards and played the game “mafia.” It was really neat to connect with each other on a different level and spend time together as a group. 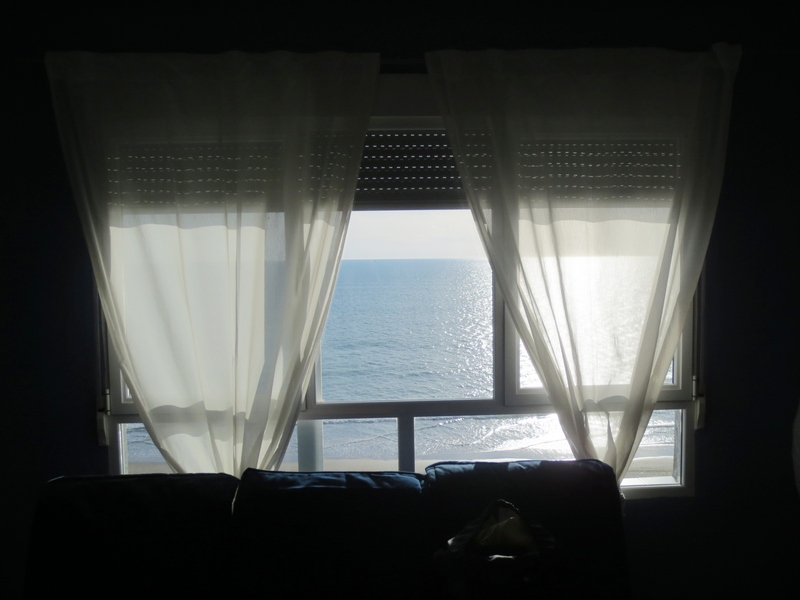 Sunday April 7 – Sunday morning we boarded the bus for a “panoramic” view of the city of Tanger and a drive to the coast to see the beautiful beaches. One of the stops along the way to the city of Asilah was an opportunity to ride a camel! We all had such a great time running around snapping pictures of each other on and next to all of the camels. Mustafa (pictured below) was by far the best camel out of all of them, and quickly became the favorite for both Courtney and me. We laughed so hard taking pictures with Mustafa as he “smiled” with us. 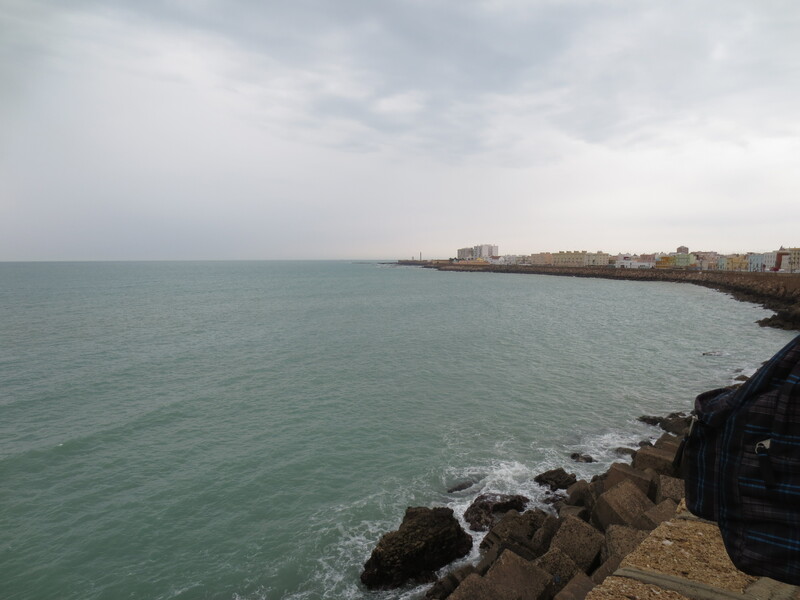 Afterwards we drove the rest of the way to the beautiful coastal city of Asilah where we enjoyed some of the local cuisine for lunch and did some shopping and exploring. 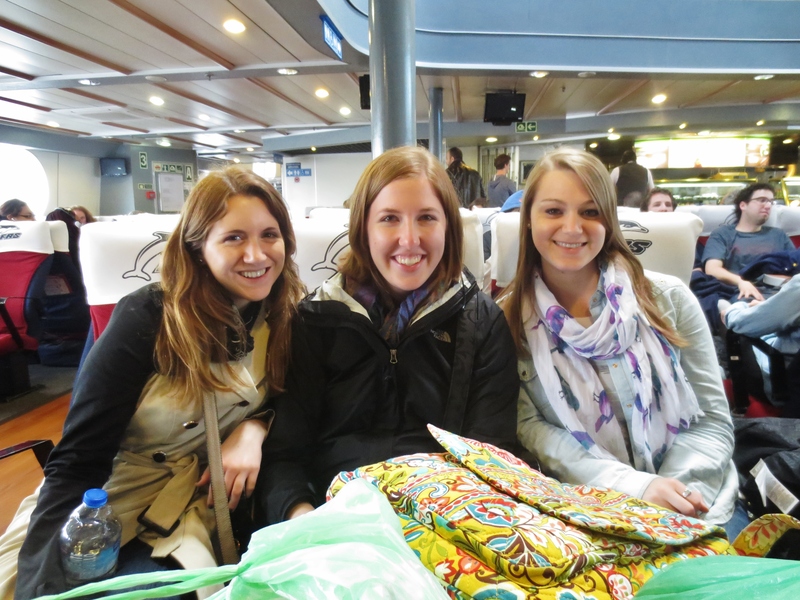 After a few hours in the city we boarded the bus to get back to Tanger and boarded the ferry to return to Spain. 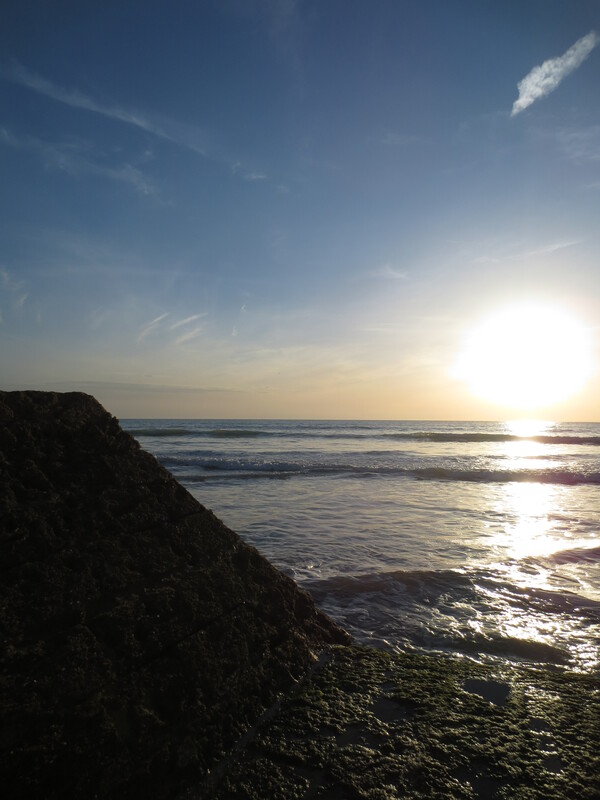 We arrived back in Spain as the sun was setting over the water, providing a beautiful background for some last minute pictures. 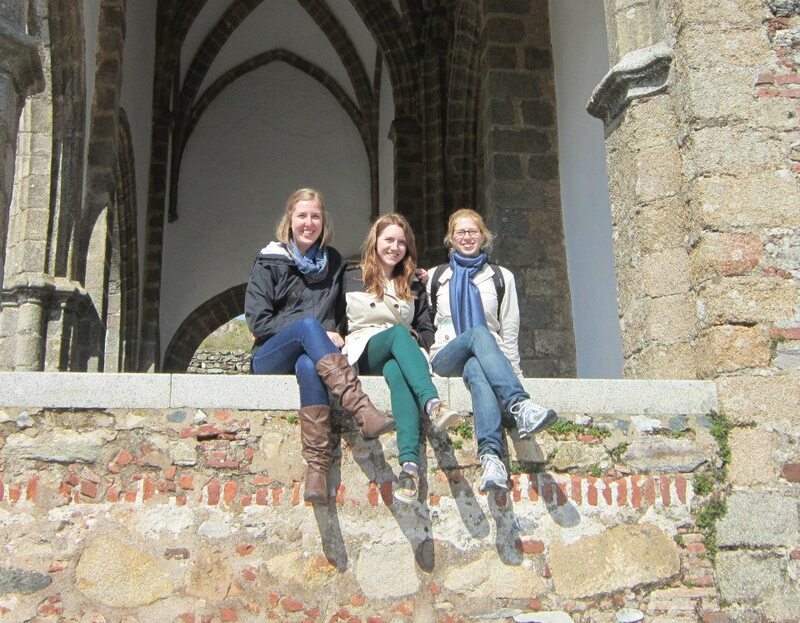 It was by far one of the best weekends I have had during my time abroad! 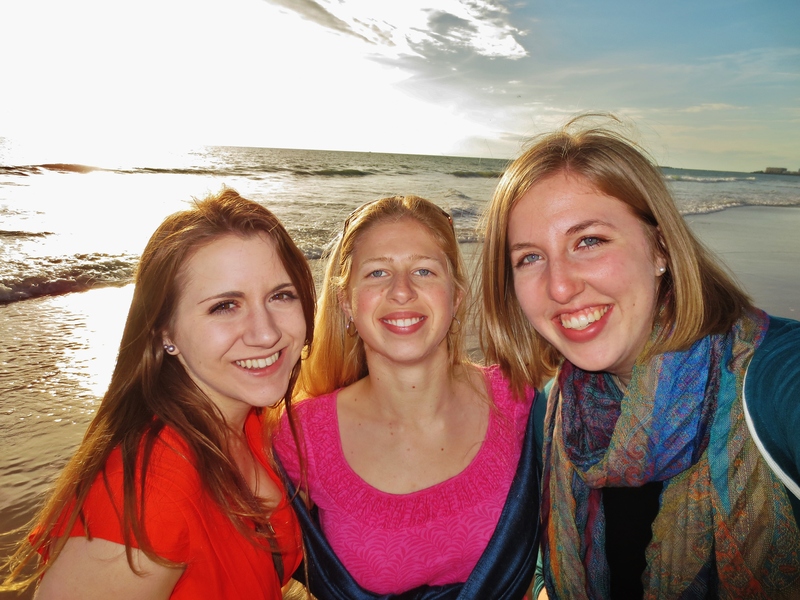 Hannah, Courtney, Liz and I – I am going to miss these girls an awful lot! 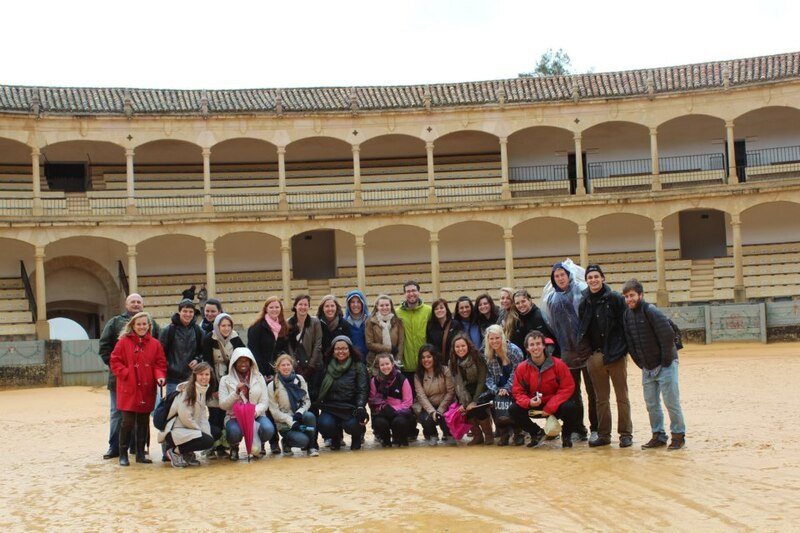 The week following Morocco was a full week of classes leading up to our Feria break. Courtney and I both got sick at the end of the week, making some of the beginning of our Feria travels very interesting. 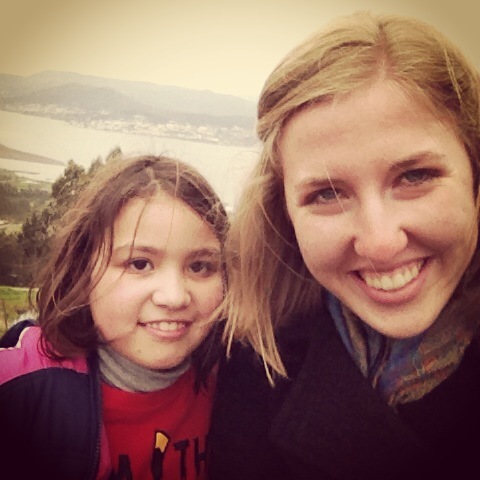 Make sure to check back for my next post about my time in Galicia with Marcela’s family (yes, round 2!). 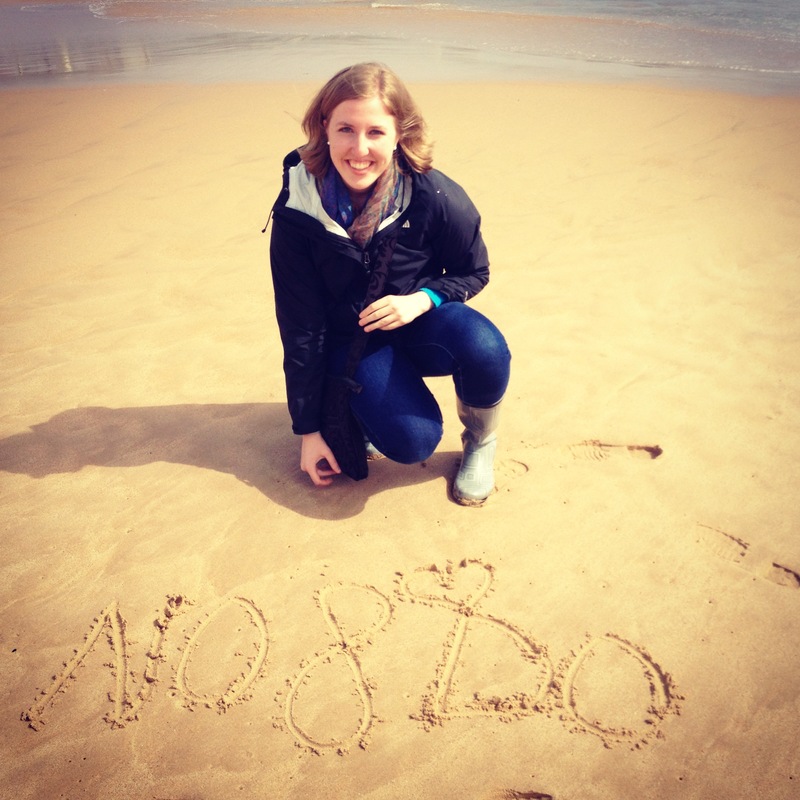 It may have been the highlight of my time abroad J I cannot wait to see everyone soon! Miss you all! 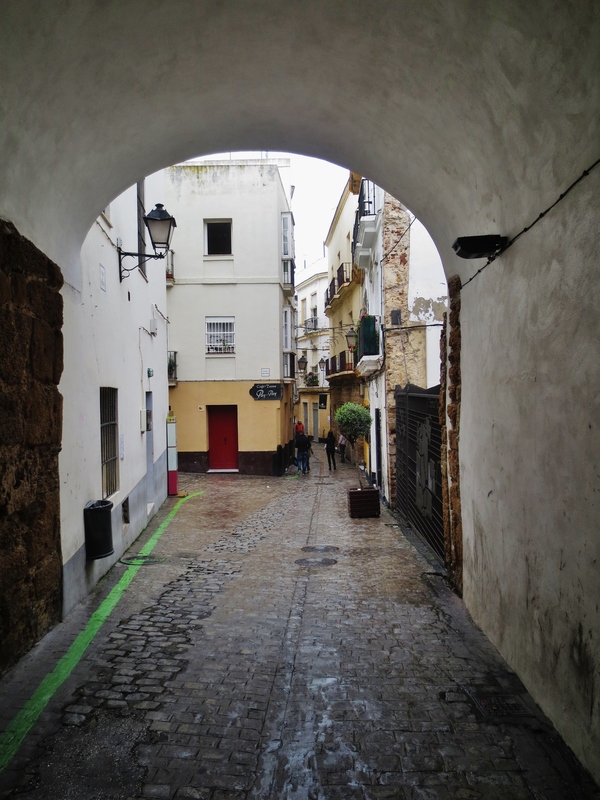 As I was sitting down to write my post about Morocco, Africa, I thought to myself… you should really write a post about a typical day in Sevilla! After all of these posts about traveling to different parts of Spain and Europe (and now Africa!) I should at least write about my favorite part of this experience… coming home to this city that I love! My days in Sevilla start early, and my alarm is always set for 6:40am Monday-Thursday. I get up, shower, and enjoy breakfast that Charo lays out for Courtney and I each evening (6:40 is WAY too early for Charo!). I leave around 7:45 to walk to school. One of my favorite things is listening to music and picking up my daily “20 Minutos” newspaper from the very kind gentleman on the corner of our street. I always try to at least read the headlines and keep myself up to date on the world. At school I am always greeted by Regla and Pepe. It makes the early mornings worth while to see their smiling faces! Every day I have my intensive grammar course at 8:15. It is a great class, and actually ended up being 4 High Point students! On Monday/Wednesday I go to Latin American history with Pepe and Tuesday/Thursday I go to my Sevilla Monuments Class, and then my 20th Century Spanish Literature class. Usually after my history class on Monday/Wednesday I grab some tostada and cafe con leche at the cafe across from the school. It has become one of my favorite things in the entire world. Below is a picture of my typical tostada and coffee, and this week we finally have great weather and we could enjoy it outside! Courtney and I eat lunch at home usually between 2:30 and 3:30, very typical Spanish lunch time. Lunch here is the biggest and most important meal of the day. It is also wonderful that we lucked out and have one of the best cooks in all of Sevilla! A typical lunch is usually beans or lentils, salad, some type of meat (chicken or fish typically), bread, fruit and yogurt! The afternoons serve quite a few purposes. Sometimes I take a short nap during siesta time, and for the majority of the semester on Monday and Wednesday I went to my flamenco dance class. 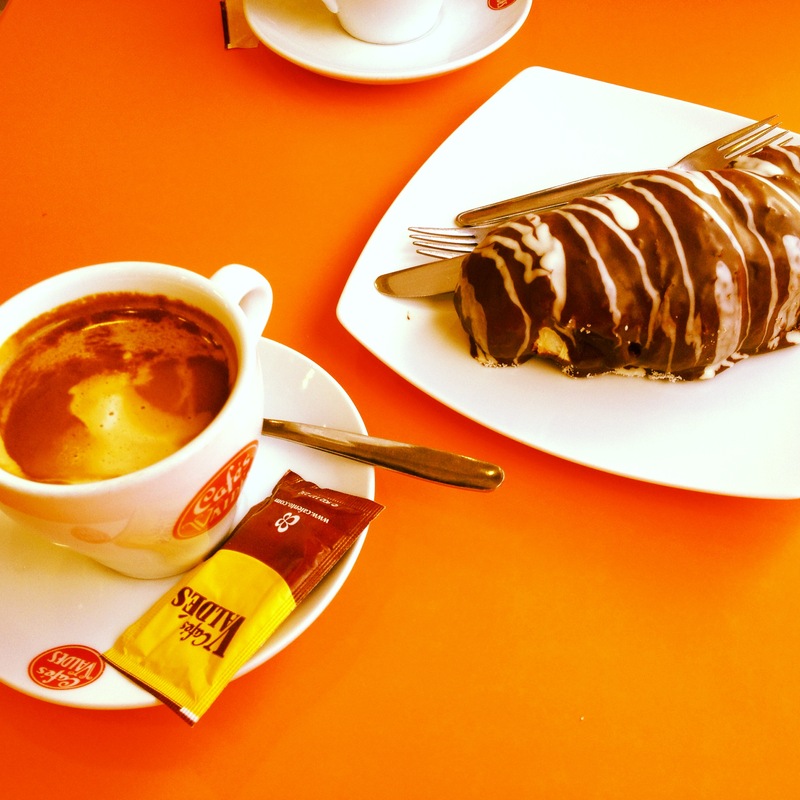 Sometimes they involve getting a hot chocolate, gelato, another cafe con leche and a suso, shopping or an activity with the school. Lately it has been used to write papers and make presentations, since it is crunch time in the semester! Tuesday evenings around 6:30 I walk for about a half hour to visit with my intercambio family. They have been such a wonderful addition to my time in Spain, and it has been fun to hang out with them for about an hour and a half each week getting to know them and practicing my Spanish and their English! We typically eat dinner between 8:30 and 9:30 in the evening. It is usually something lighter since we have such a large lunch, and since we eat so late in the evening. We usually end up talking with Charo for a while or watching some TV with her, and then it is back to studies, blogging, updating pictures, and more than anything laughing and enjoying our time together. This week Courtney and I were both sick, but I cannot describe to you what a blessing Charo has been during our time of illness. She made us homemade broth and soup, bought fruit and lots of Aquarius (similar to Gatorade in the States) and even brought us dinner in bed with some chamomile tea. I am thankful for this home away from home, especially when we aren’t feeling the greatest! Hi everyone! 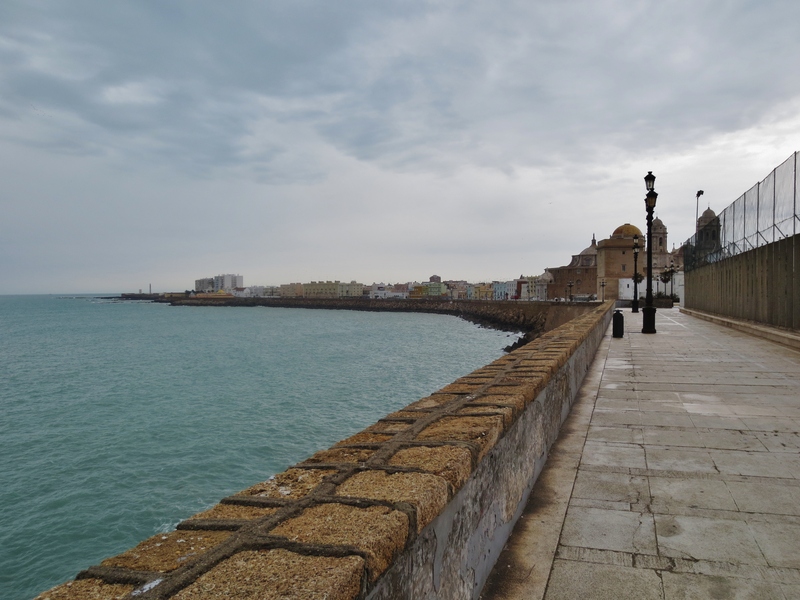 I am so disappointed that my Cadiz post has disappeared, but I am at least going to try and repost some of the pictures and captions since Cadiz was by far one of the most beautiful places I have visited on my trip! 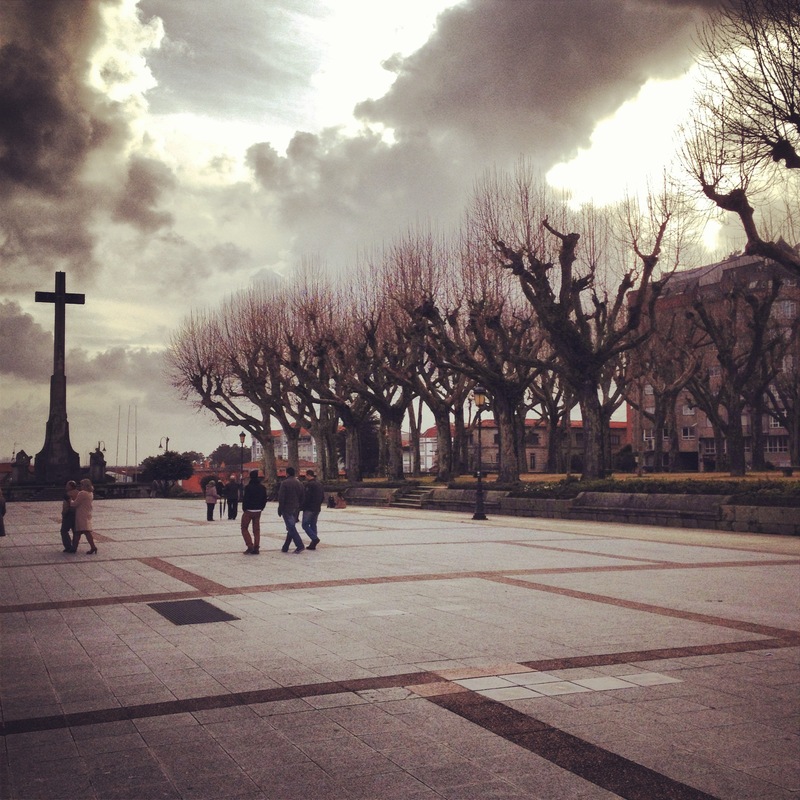 My heart is overwhelmed with the love and hospitality that I have experienced since arriving in Vigo on Saturday. I was invited to stay with Marcela’s family (my very close friend, mother-figure and mentor) for the week of Semana Santa.The majority of her family I have never had the chance to meet and yet as I sat on the thirteen hour bus ride (yes you read that right.. thirteen hours!) 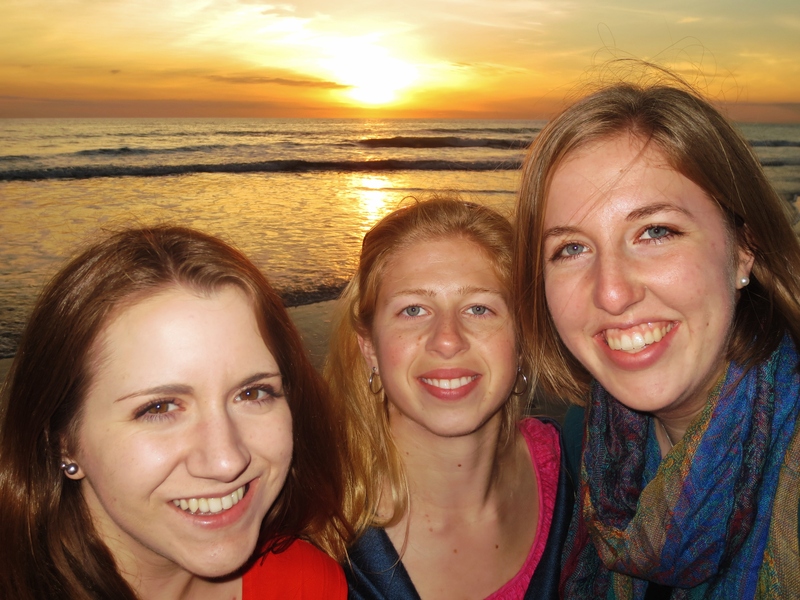 I felt as though I was finally traveling home for a “spring break” with family. I had no idea what a blessing I was in for! 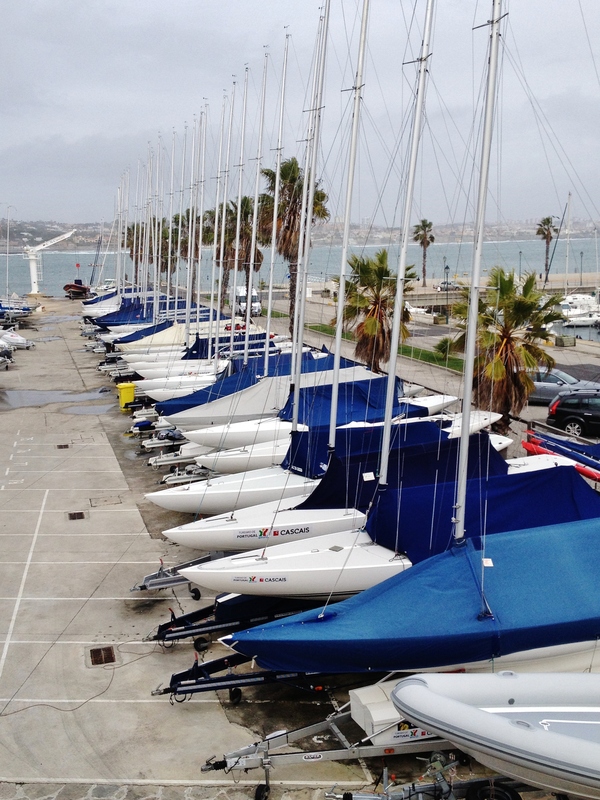 I arrived Saturday morning around 7:30am after leaving from Sevilla on the bus around 6:15pm. 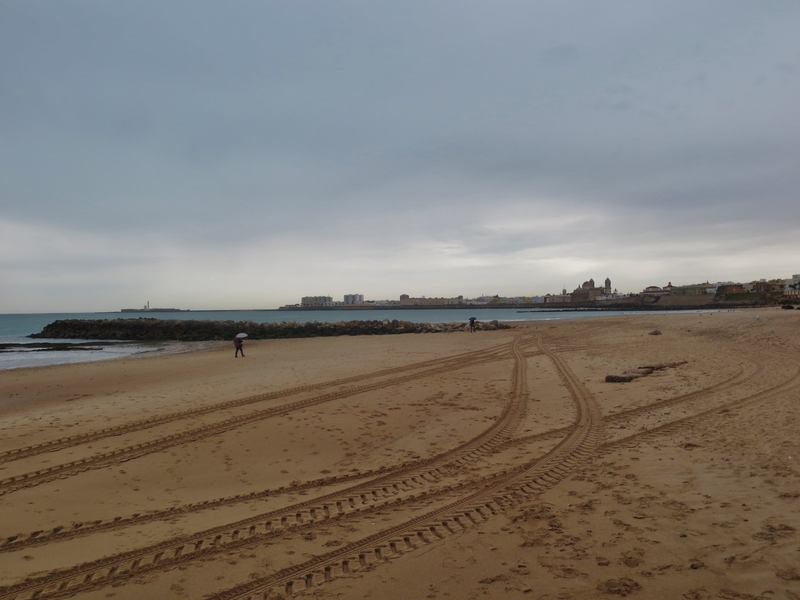 Marcela’s family lives in Vigo and Pontevedra, two cities in Galicia, the northern region of Spain above Portugal that are very close to the coast. I was greeted at the bus station by Vivi (Marcela’s older sister) and Paco (Vivi’s husband) and received two big hugs that I so desperately needed after a tiring journey on the bus. Vivi and Paco only live about 5 minutes from the bus station in Vigo, and we returned to their house to eat breakfast and go back to sleep. I was so thankful that despite my exhaustion, my spanish still managed to come out! Jessica and Angel, the children of Marcela’s youngest sister Veronica, were staying with Vivi and Paco, and that afternoon the five us drove around the city of Vigo stopping at the beach to see the beautiful Cies Islands in the distance. 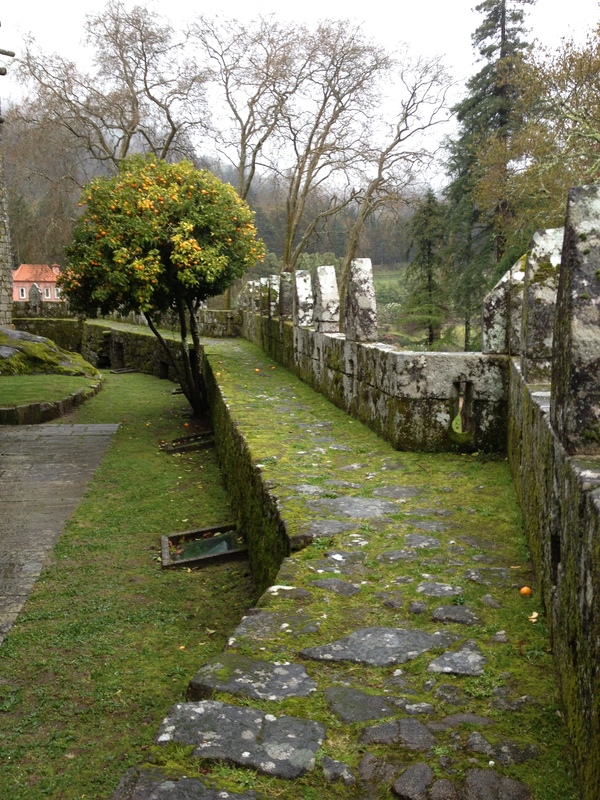 We also drove to the top of a hill to see some Celtic ruins and the river that separates Portugal from Spain. Afterwards we went and took a ferry across the river and drove along the Portugal/Spain (and stopped for a pastry and coffee of course!) before taking a bridge back in to Spain to Vigo. It was such a fun day, and nine year old Jessica quickly became my very best friend. Angel (who is 11) and Jessica both speak very fast, and it has been a challenge trying to keep up with them! Sunday morning we slept in and then drove to Veronica’s house in Pontevedra to take Jessi and Angel home and to eat lunch together. It was great to all be together (except Marcela’s parents who come home Thursday from Venezuela and Angel, Veronica’s husband who is working in Venezuela) and to see Veronica! Never in my life have I felt so welcomed and comfortable in a new place! 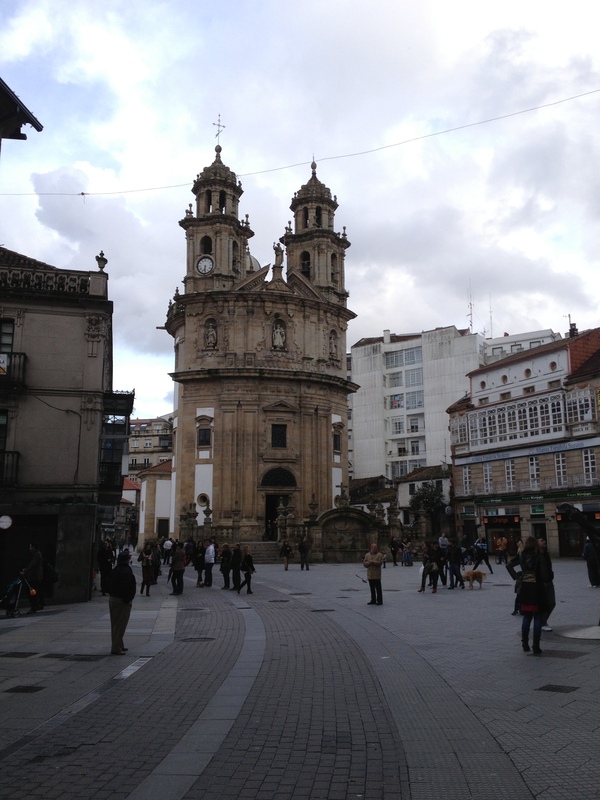 After lunch they took me into the center of the city of Pontevedra, and Veronica showed me some of the many stores, churches and parks of the city. In the evening I went back to Vigo with Paco and Vivi to stay with them. Monday was a relaxing day and I was able to get some sleep, eat breakfast and drink coffee while watching it rain and play guitar! It’s not piano, but it was sure wonderful to make some music after two months of not playing anything. In the evening we went to the grocery store together and on the drive home laughed really hard sharing tongue twisters in both Spanish and English. Sometimes it is the simplest things that make life the most beautiful! 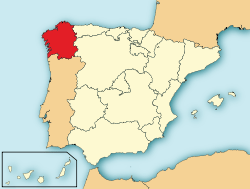 On Tuesday, Veronica and the kids came to Vigo to pick me up and take me to spend the rest of the week with them in Pontevedra. Vivi and Paco have other company coming. 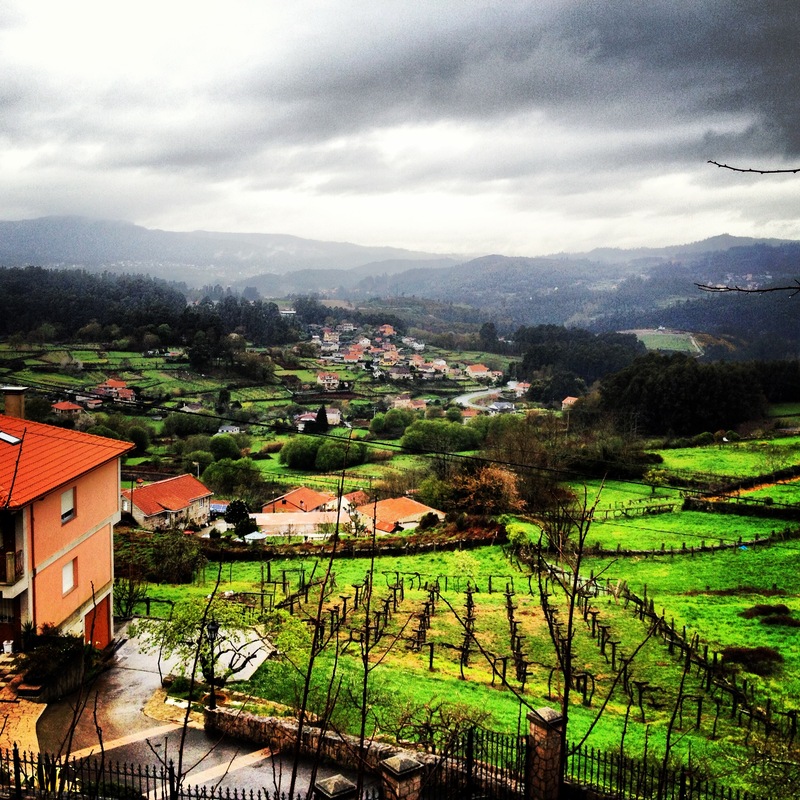 After they picked me up we drove to the Castelo de Soutomaior and saw some of the beautiful Galician countryside. We enjoyed singing Pablo Alboran while we were in the car (one of my new favorites!) and talking and laughing together on our way back to the house. 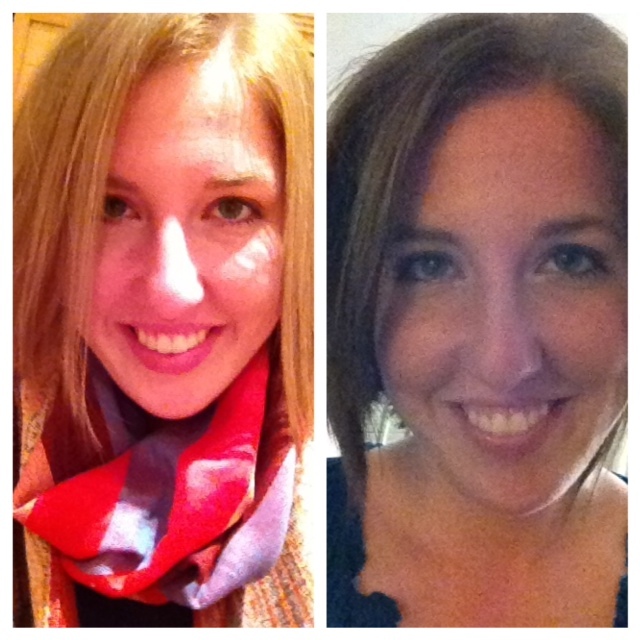 When we arrived home, Veronica started with my hair! She is a hairdresser and has quite a few clients that come to the house which means she has a great set-up to do a variety of things at home! She cut and colored (yes… the first time that has ever happened… it’s not quite done yet so I will leave you hanging with what is coming.. .don’t worry nothing drastic 🙂 ) my hair and we talked and talked (great practice for me!). She made arepas for dinner, a traditional latin-american dish that Marcela usually makes me that I absolutely love! 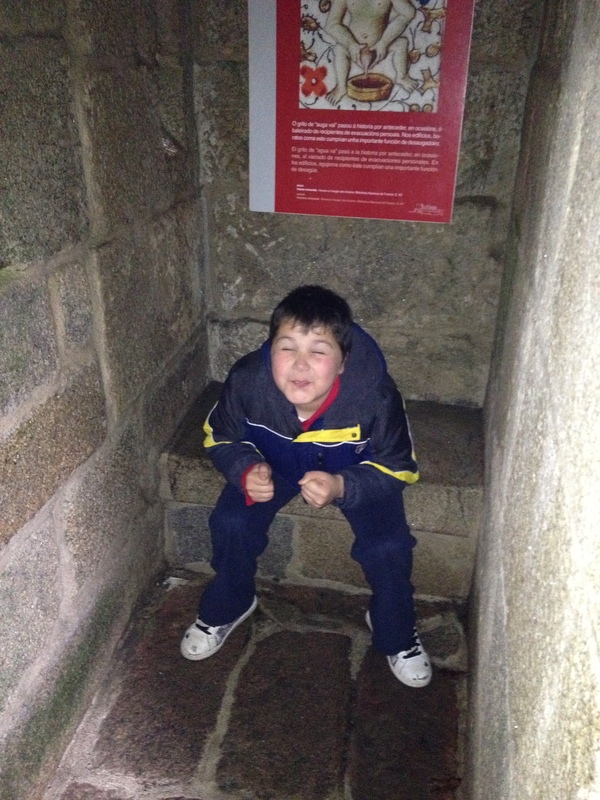 Angel being silly at the Castle! Tomorrow I finally get to meet Marcela’s parents! It is truly a dream come true to be here spending the week with her family. Out of all of the trips that I have taken during my time abroad, this one clearly stands out above the rest because I truly feel like I have come home. I have already purchased tickets to return in April during my week-long Feria break and cannot wait to spend more time with this amazing family! What a tremendous blessing!! 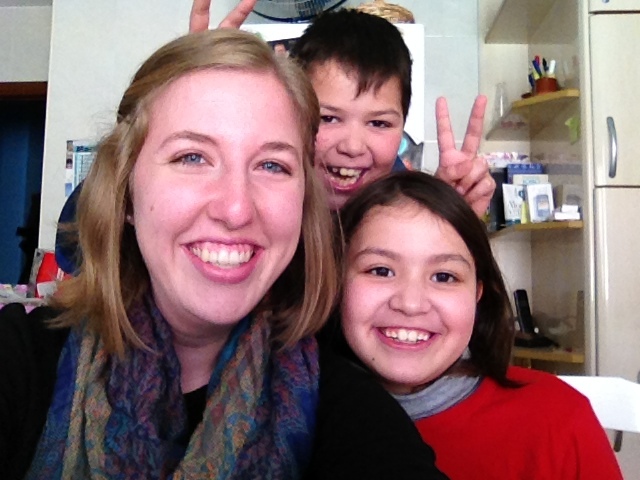 I hope everyone is doing well, and I cannot wait to share more about the rest of my time with Marcela’s family soon! Miss you all!! 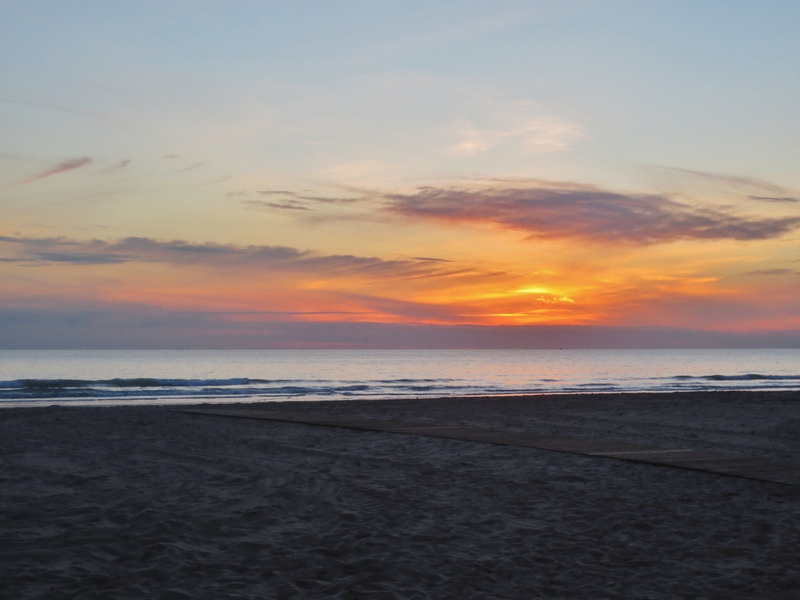 Does time move faster in Spain? I think it does!! 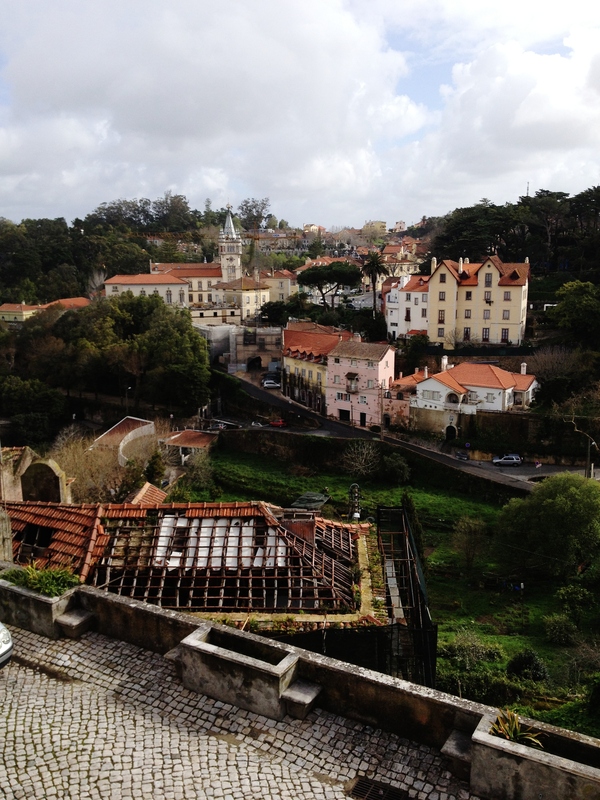 March 8-10 we had the opportunity to travel to Lisbon, Portugal for the weekend! Friday we woke up bright and early to catch the bus at 6:30am. 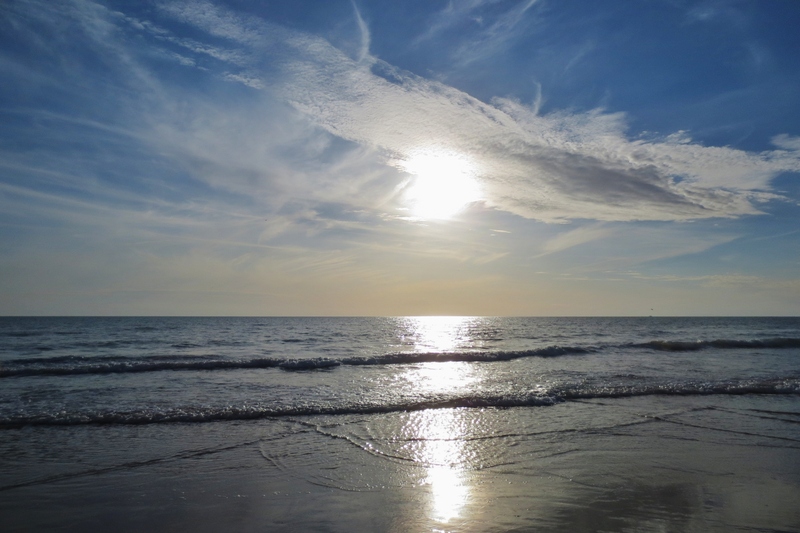 It took us about six hours with stops to make it to the capital, and between cat naps we had a chance to really soak in the beauty of Southern Spain and Portugal. We arrived at the hotel around noon and had a chance to “siesta” a little before taking a bus tour of the city. It was neat to see where the river meets the Atlantic Ocean and to see the bridge that looks just like the Golden Gate in California (it was designed by the same person.) Lisbon is very well-known for their pastries, and we tried the famous “Pasteis de Belem” after touring the beautiful church of the city. 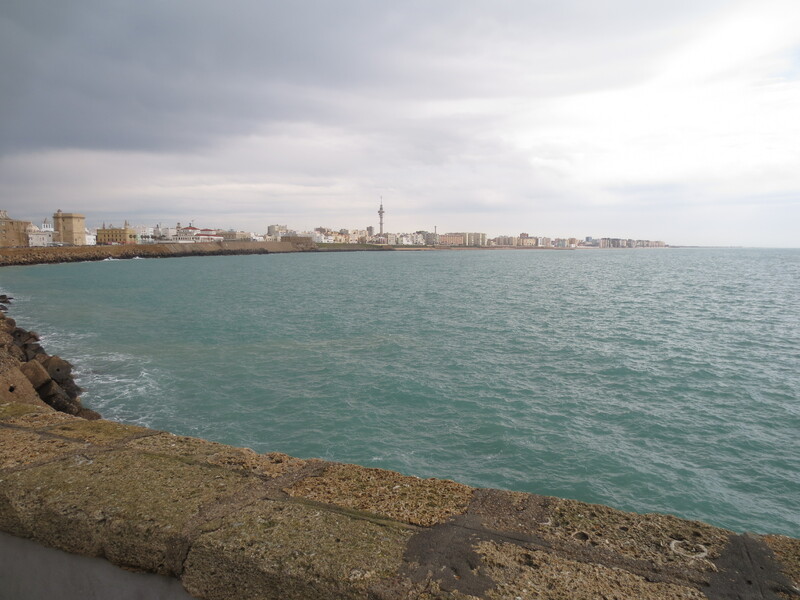 We continued to travel to the different sites of the city and tried to make the most of it despite the rainy, windy weather. After the tour, we ate dinner in the city and explored some more before calling it a night. We were pretty tired from all of the travel during the day! Saturday (by far my favorite day), we departed the hotel in the morning and traveled to two different cities that are each within an hour of the capital. 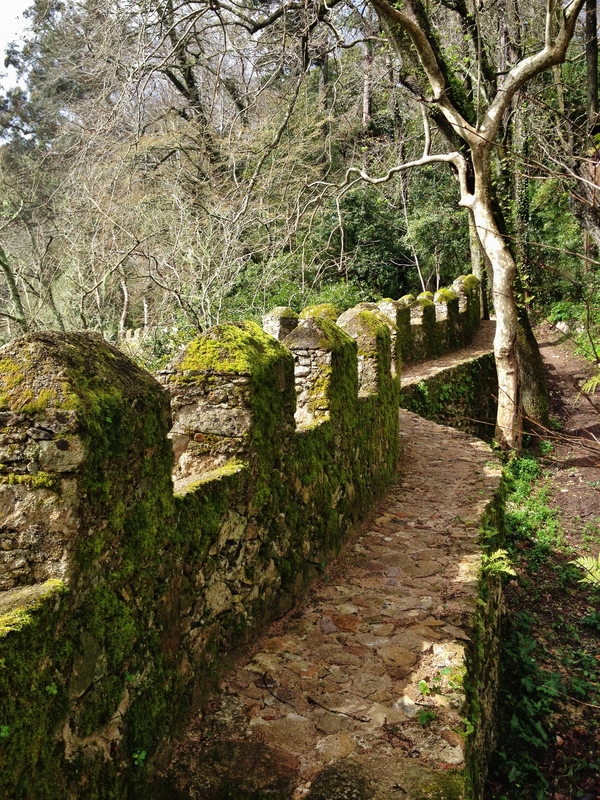 We started in Sintra, a small city in the mountains known for their microclimate (it is nice and cool there during the summer) and pastries. 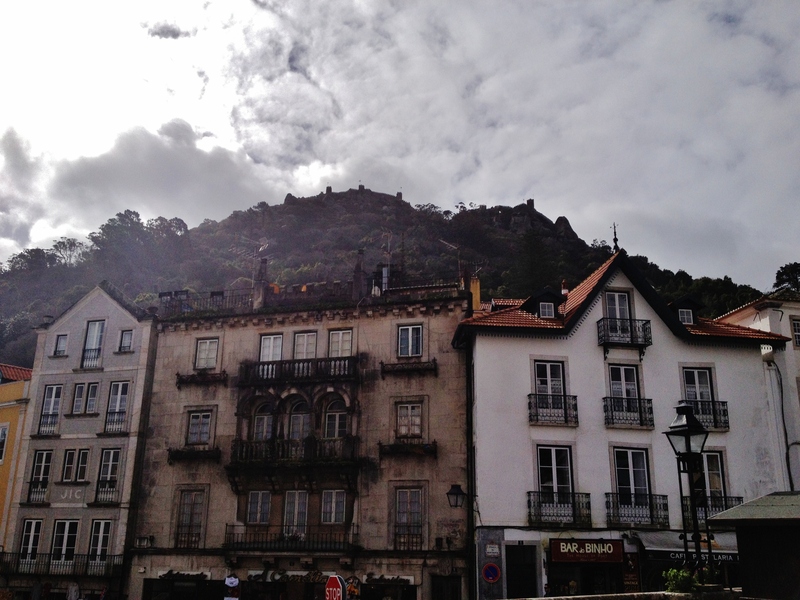 We had about three hours in the city, and some friends and I decided to hike to the top of a mountain to an old Moorish Castle. The hike takes about an hour, and the views from the pathway were absolutely stunning! After our hike, we went back down to the center of the city and tried some of the famous pastries, as well as cherry liquor that is served in a small chocolate cup. They were both delicious! 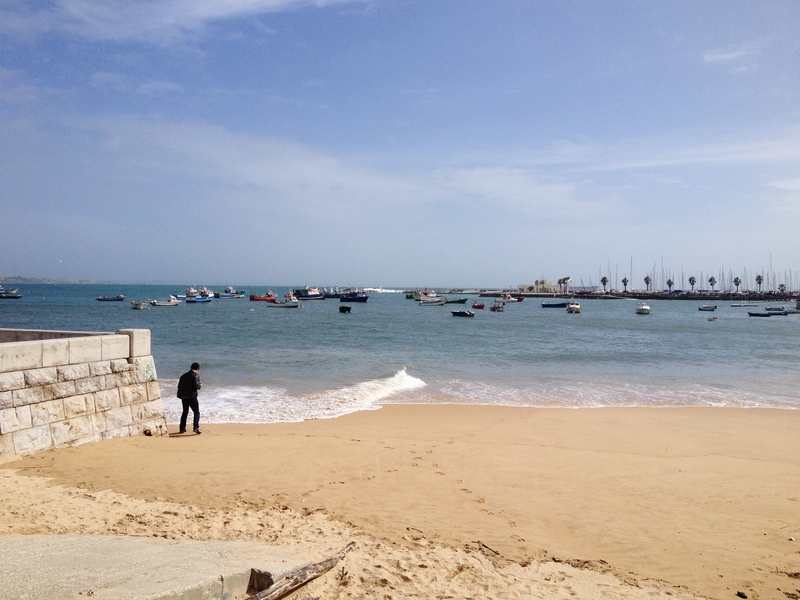 We headed back for the bus and drove to our next town, Cascais, which is a beach town! 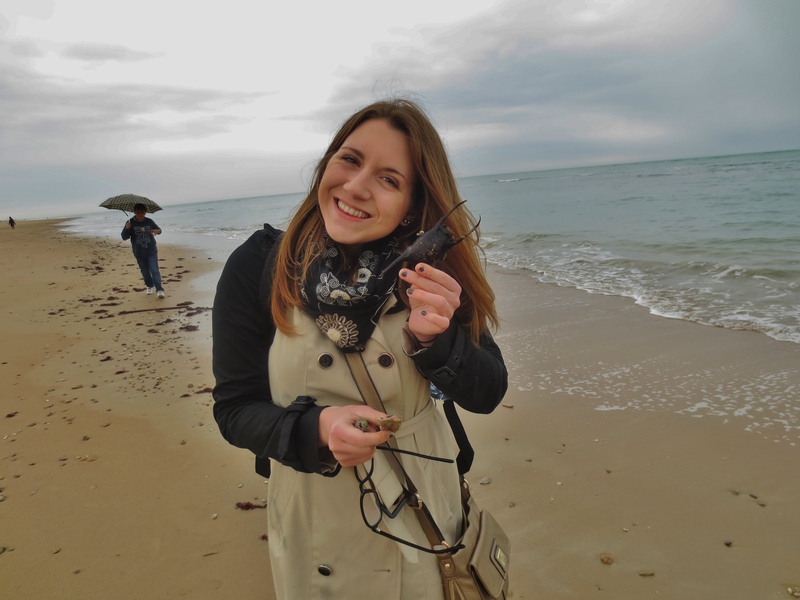 We ate lunch at a local restaurant, enjoying some seafood and then taking time to explore, shop and take pictures. It was a beautiful city! 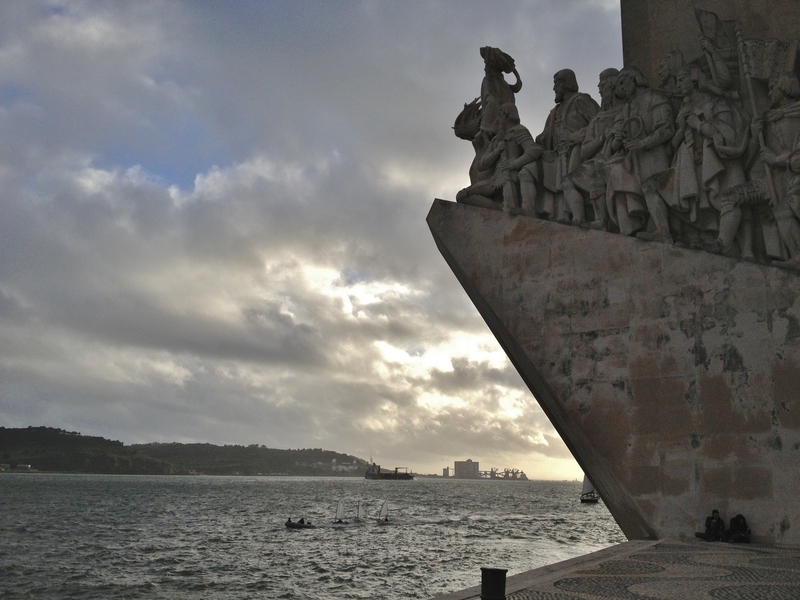 That evening we returned to Lisbon, and my good friend Hannah and I did some research to find a delicious dinner location. 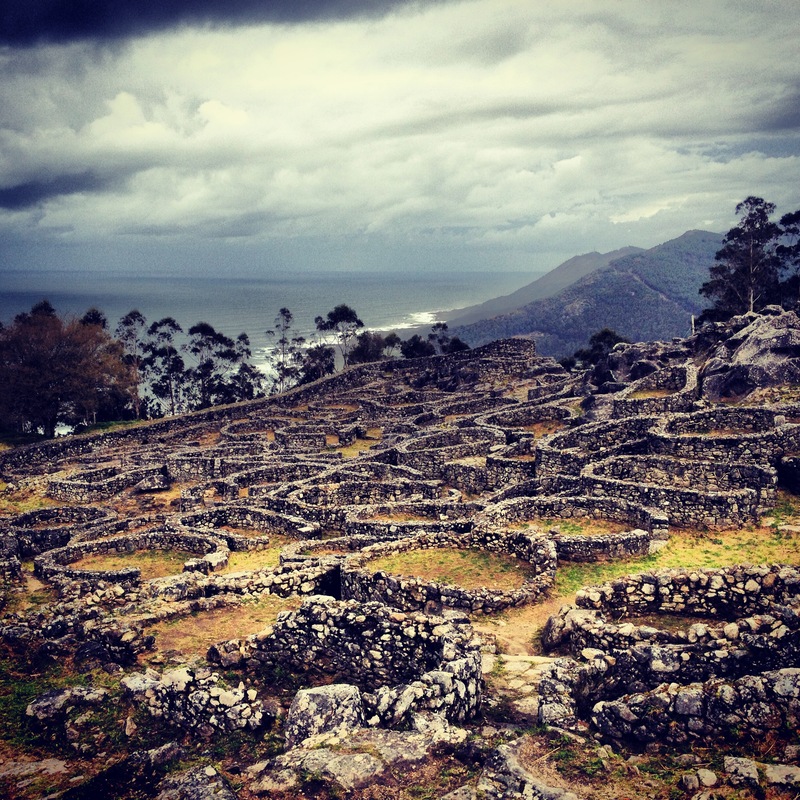 We explore the Castle of St. Jorge and then enjoyed dinner and some cider and wine afterwards. Sunday morning we woke up a little earlier than necessary before we left so that we could take one last walk in a park of the city. 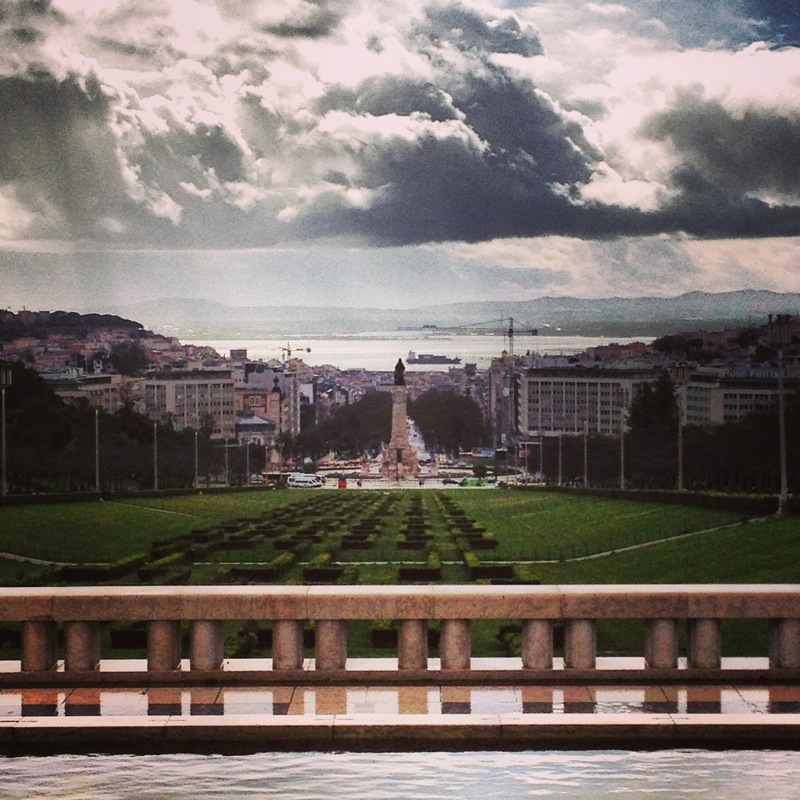 I wish I could describe to you the beauty of Lisbon! We had a five-day week of classes after our trip in order to make up some days missed during the upcoming Feria holiday. One of the highlights of the week was a “gift” from my favorite professor, Pepe. Pepe teaches my history class, and over the course of the semester has become sort of a father figure to me, especially since it is just Courtney, Charo and I at home. He always has the best travel advice and is by far one of the most knowledgeable people I have ever met! After talking about music together on Monday, he brought me a flash drive full of his favorite Spanish music (he too is passionate about music!). It had a little bit of every thing, including some classical pieces by Spanish composers. It was quite the surprise and definitely made my week! 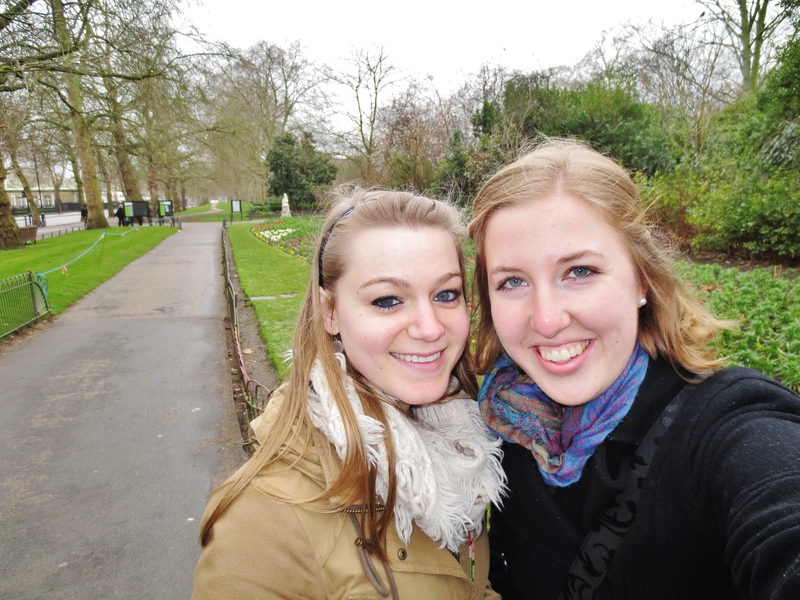 How do I even begin to highlight some of the adventures from our five day “weekend” trip to London and Dublin? What seemed like a far off dream officially became reality this weekend, and I cannot think of a better way to celebrate Courtney’s birthday! 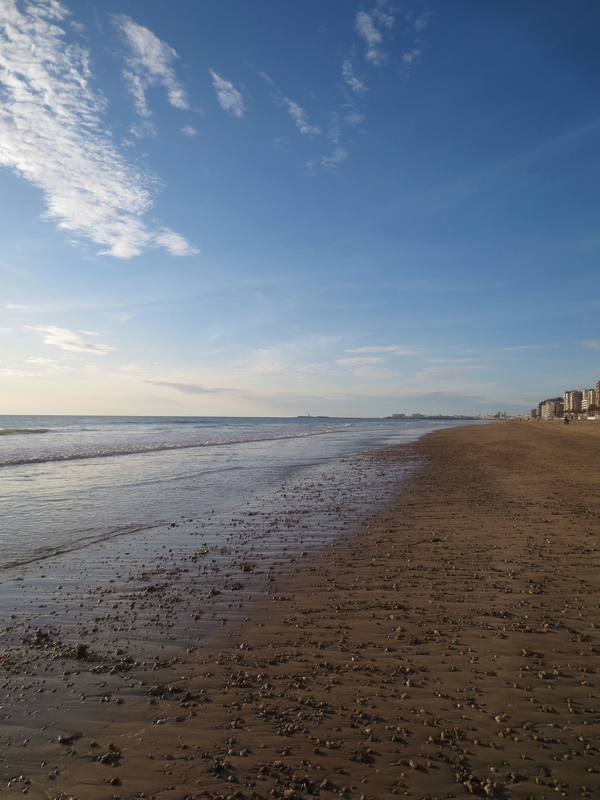 Thursday was a holiday in the south of Spain, allowing us to leave bright and early and take the bus from Sevilla to Madrid to catch our flight to London. The bus ride took about six hours, and we encountered some interesting weather along the way! 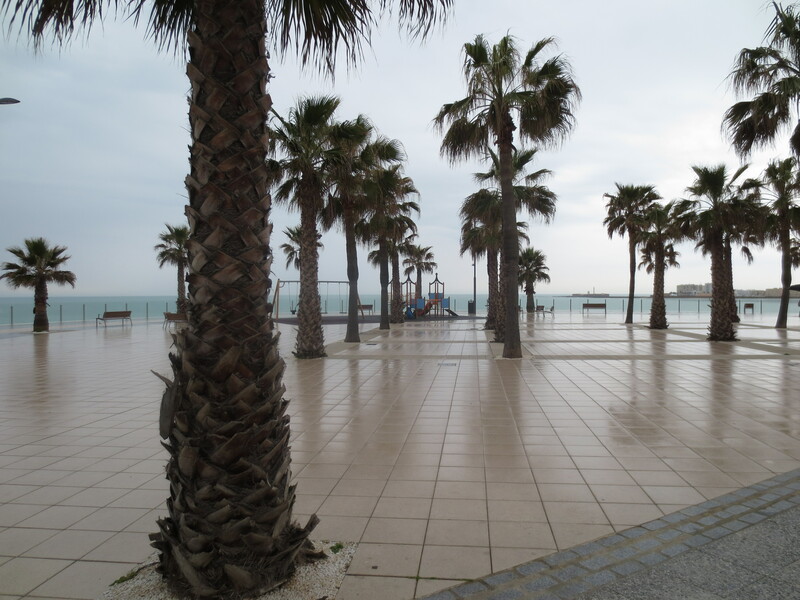 Yes… we really did see snow in southern Spain! Our yummy homemade lunches and lots of talking and music made the bus ride pass quickly. At the airport we met some fellow Spanish students who were also going to London over the long weekend. It was neat to meet them and to share stories and experiences from our time abroad. On the plane I was able to sit next to a wonderful young woman from Madrid who was only a few years older than me. A few minutes in to talking, she asked me if I was from the south because she noticed my Andalusian accent. I could have cried of happiness!! I enjoyed talking with her during the flight and was encouraged to hear that my spanish is improving! We arrived in London around seven in the evening, and took an hour bus ride from the airport to Victoria Station in the heart of the city. 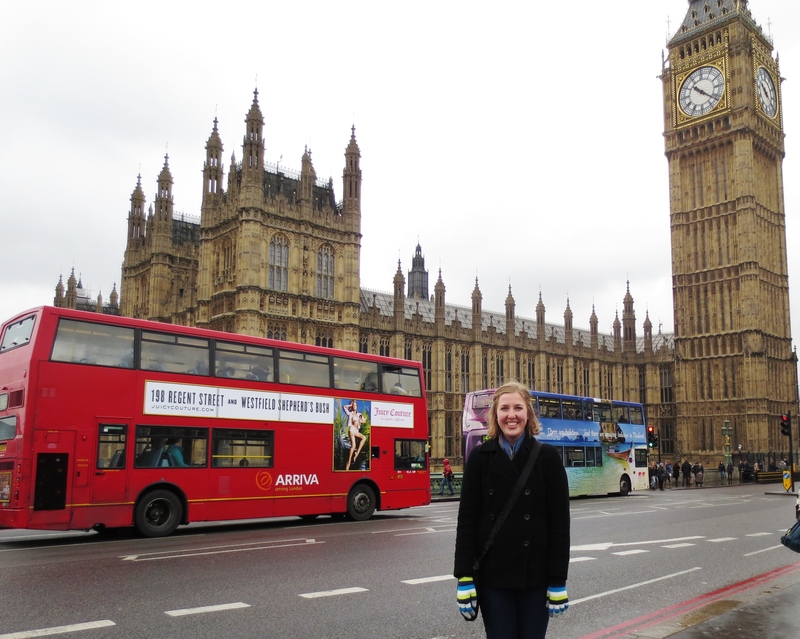 Our walk from the station to our hostel was perfect for seeing some of the most popular sites! 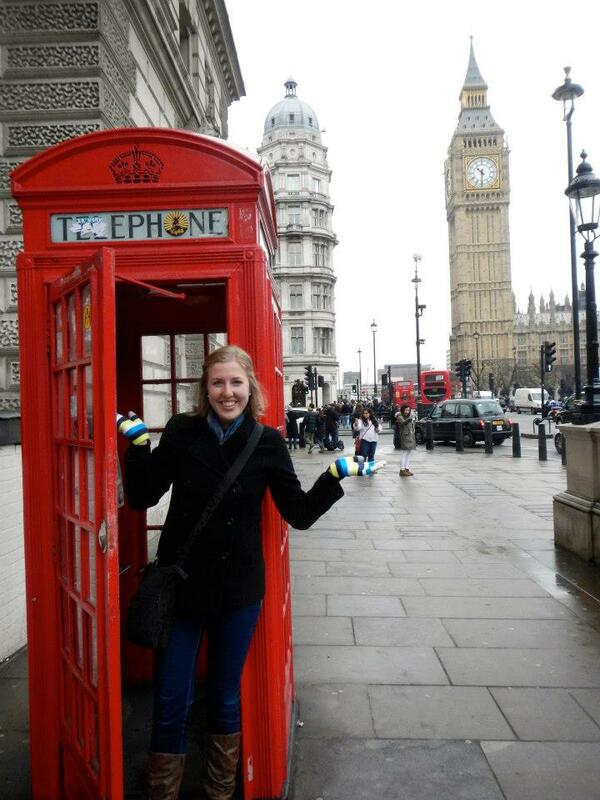 We walked by Westminster Abbey, Big Ben and Parliament, the Thames River, the London Eye and even snapped some pictures of the classic red phone booths before hailing a taxi to take us the rest of the way to the hostel. 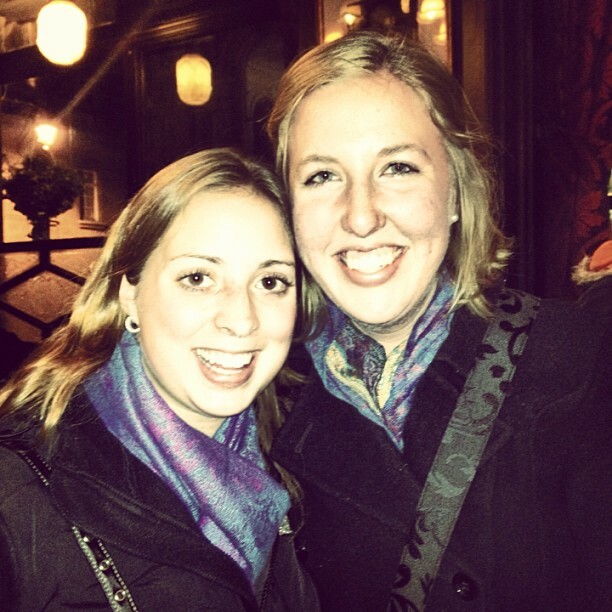 We were not accustomed to the chilly weather of London! We were pleasantly surprised with how neat our hostel was and Friday morning we enjoyed a yummy complimentary breakfast before starting our crazy day. We walked EVERYWHERE! We traced our path afterwards and discovered that just our walking from site to site was ten miles. 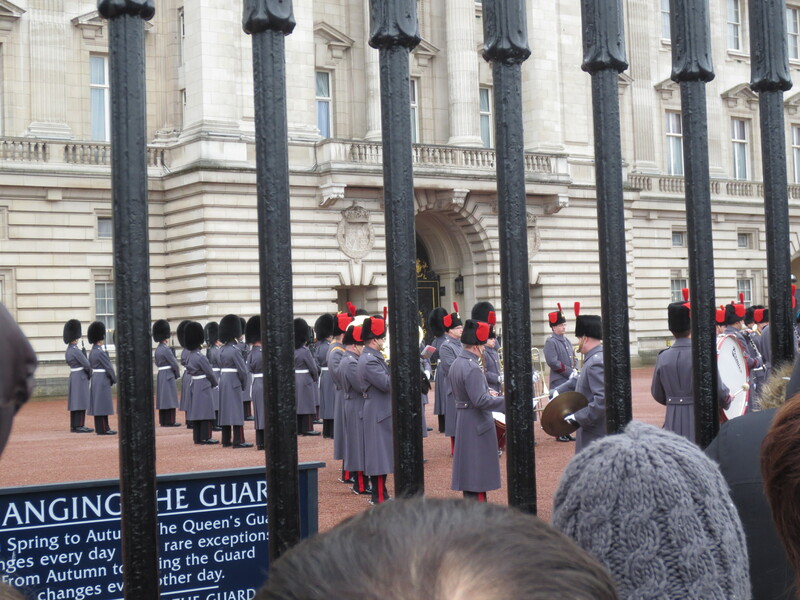 To start the day, we walked from our hostel to Buckingham Palace, and had the chance to see the changing of the guard. We were joined by a few other people (you know.. just a few tourists), but despite the crowds enjoyed this neat piece of tradition. 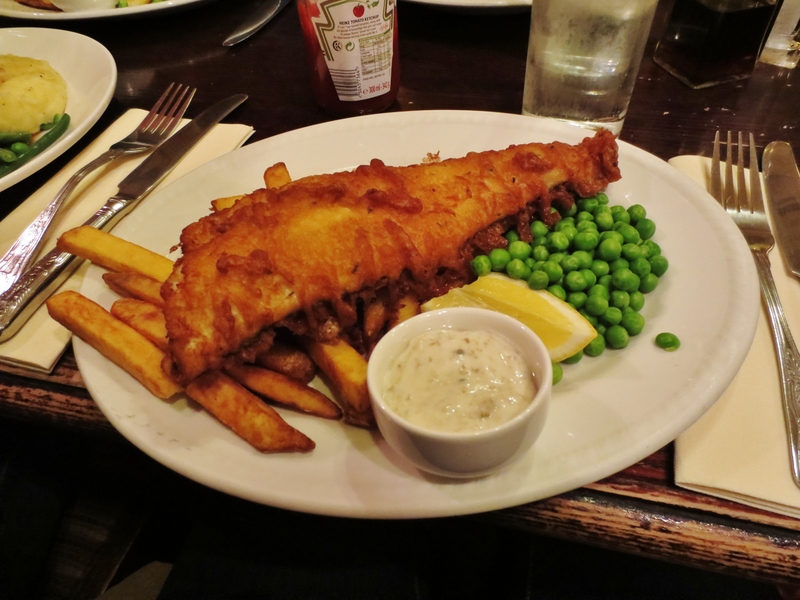 Afterwards, we walked through St. James Park before finding a cafe close to Big Ben to enjoy a warm cup of coffee and our first “fish and chips” during our stay in London. It was delicious, and exactly what we needed to cut the cold! 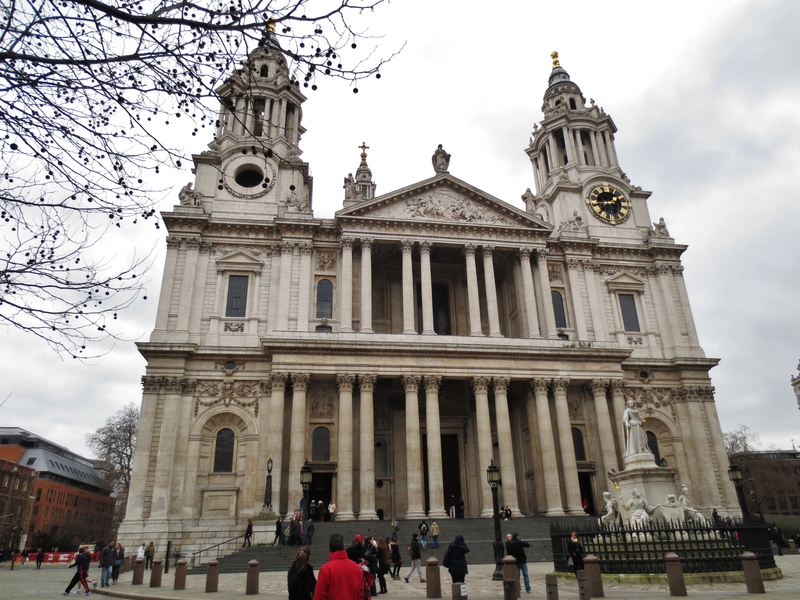 After lunch, we walked along the river and weaved through the streets of London to find St. Paul’s Cathedral. 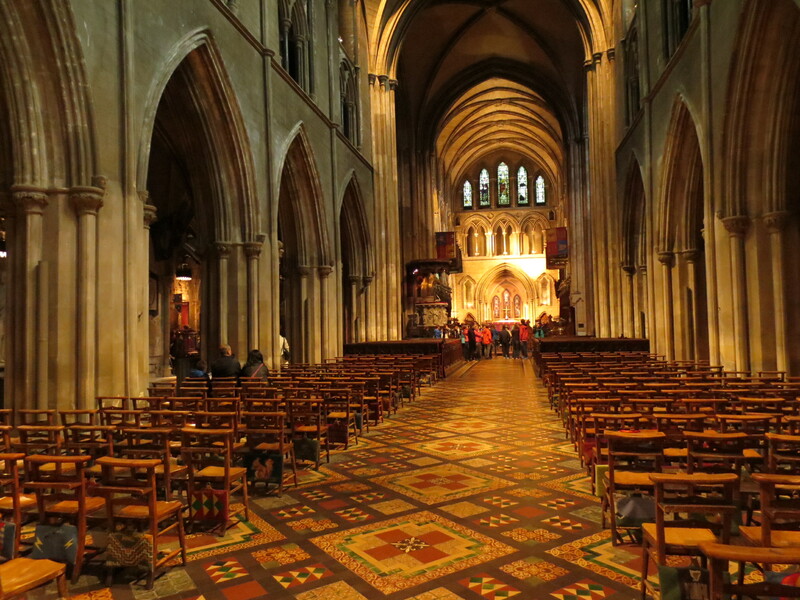 It was absolutely stunning and we had the chance to see some of the inside before making our way to London Bridge. 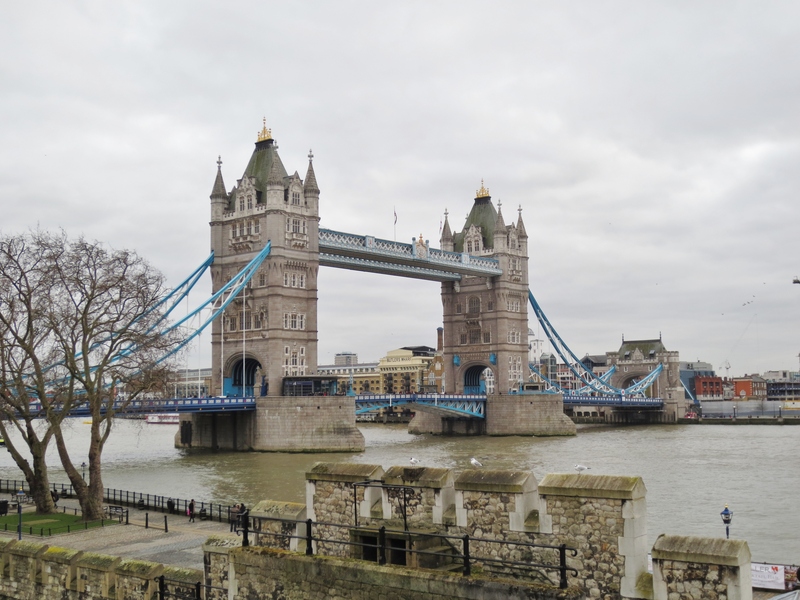 At the bridge we discovered a “secret staircase” that lead us to a path where we could walk along the river with stunning views of the Tower Bridge. 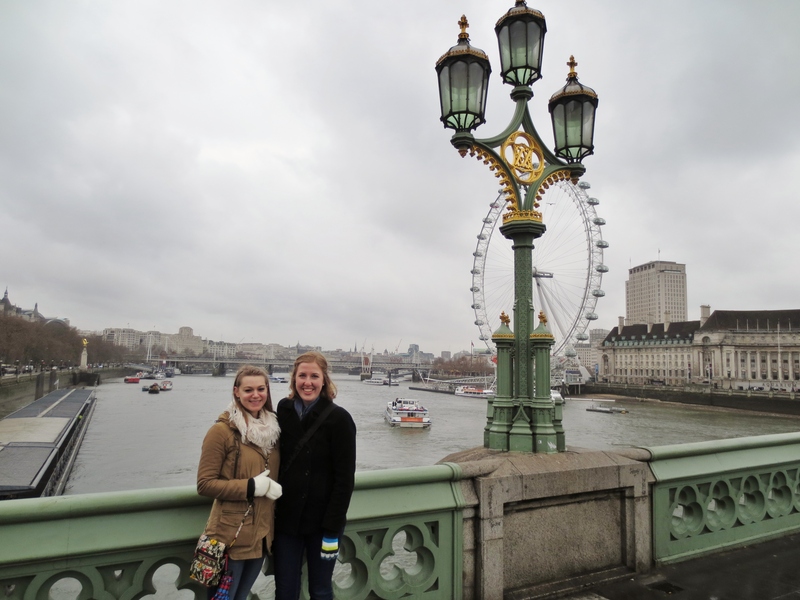 We walked the whole way to the London Tower and spent about two hours there. 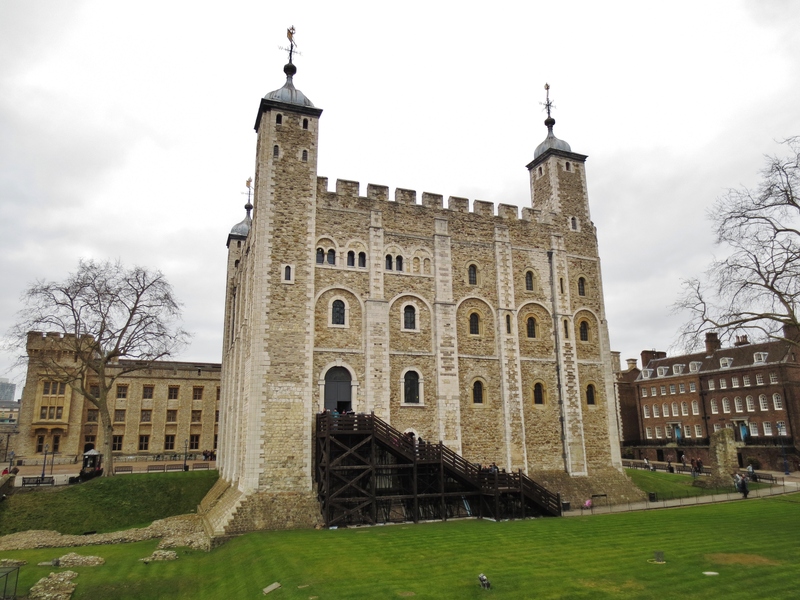 The Tower is home to the Crown Jewels! It was really neat to see so many different pieces of history at the Tower. Afterwards we walked across the river on the Tower Bridge (London’s pretty bridge) to the other side of the river where we went to Borough Market. This is an outdoor market that sells a wide variety of items, and we enjoyed a delicious homemade soft pretzel. 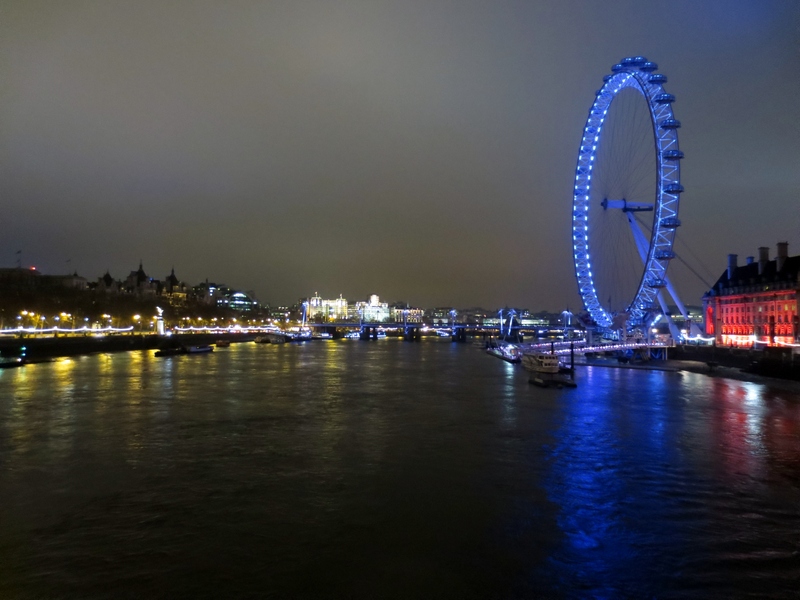 We walked back to the other side of the river and eventually made our way back to Big Ben where we met up with my good friend Carlie and her friend Mark who is studying abroad in Scotland and was able to visit for the weekend. Carlie and I have been friends since first grade and have experienced so much together and it was so neat to meet up with her in London! We enjoyed dinner together and afterwards she bought me her favorite strawberry kiwi cider to share. 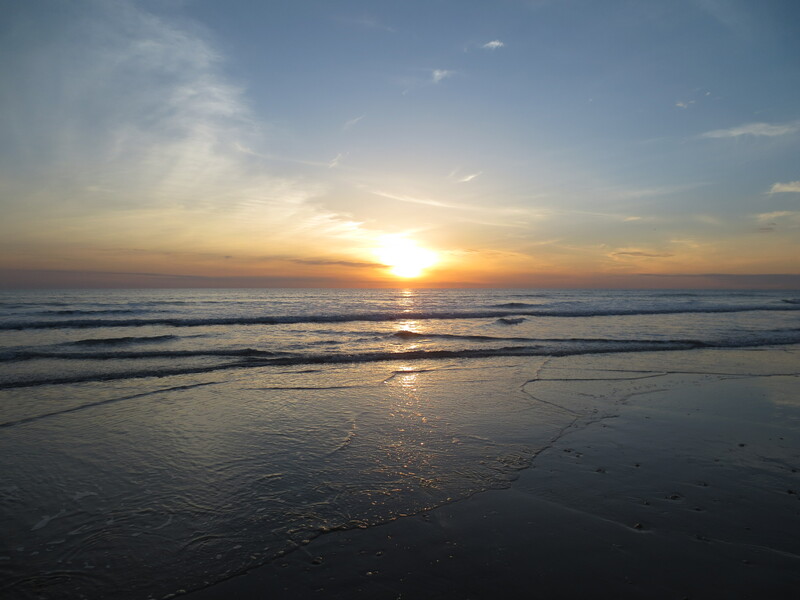 It was the perfect ending to a great day! The next morning we once again enjoyed our complimentary breakfast at our hostel (including the awesome Spanish style coffee) and we made our way to the London Eye. 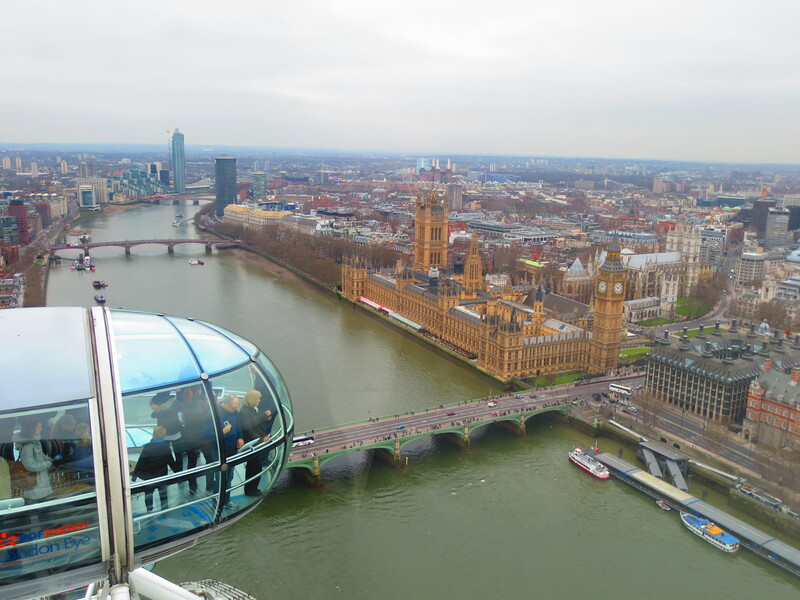 It takes about a half an hour for the eye to make a complete revolution, and we enjoyed the beautiful views of the city. 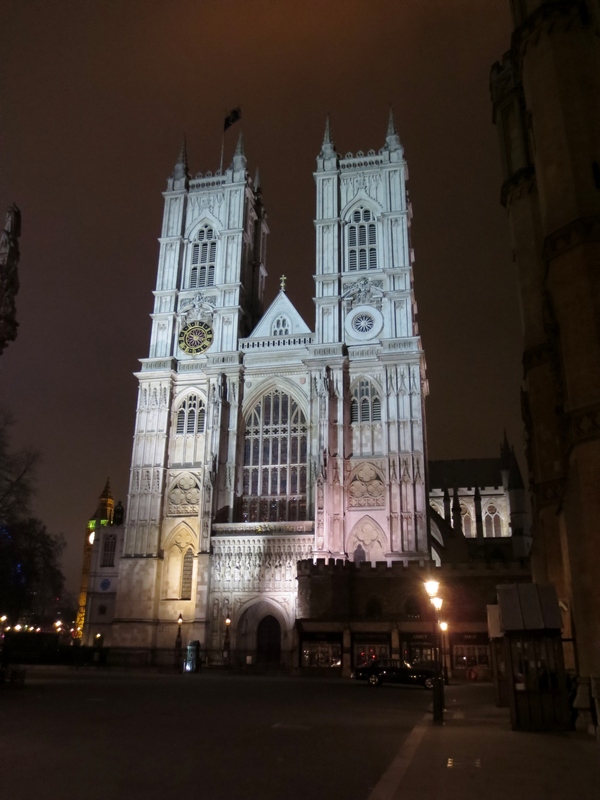 Before walking back to the bus station, we were also able to tour Westminster Abbey, best known for the recent wedding of William and Kate. Unfortunately we were not able to take any pictures, but the church is absolutely stunning. We walked over the graves of many different people such as Charles Darwin and one of my all-time favorite composers, Ralph Vaughan Williams. We got a much needed cup of coffee before boarding our bus to take us back to the airport. The flight from London to Dublin was beautiful, and the sun was just beginning to set in the evening sky as we left London, what is now definitely one of my favorite cities. 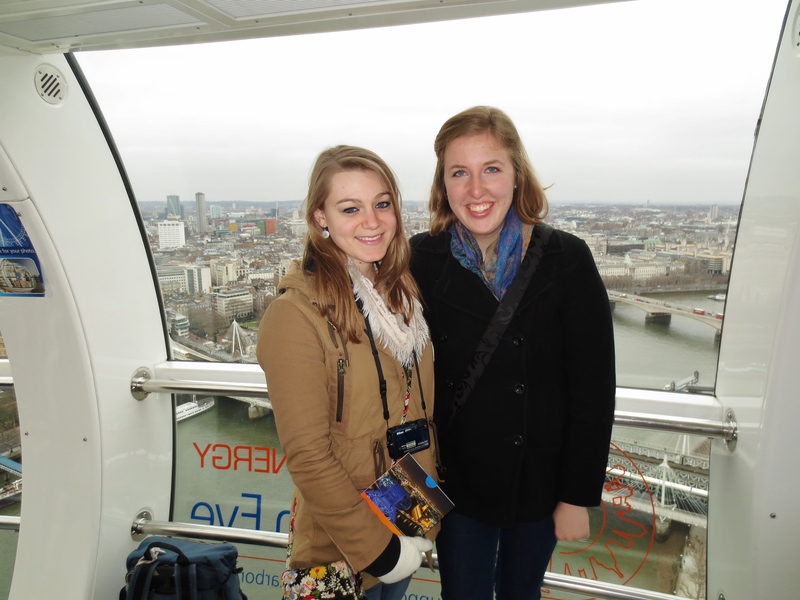 Courtney and I riding the London Eye! 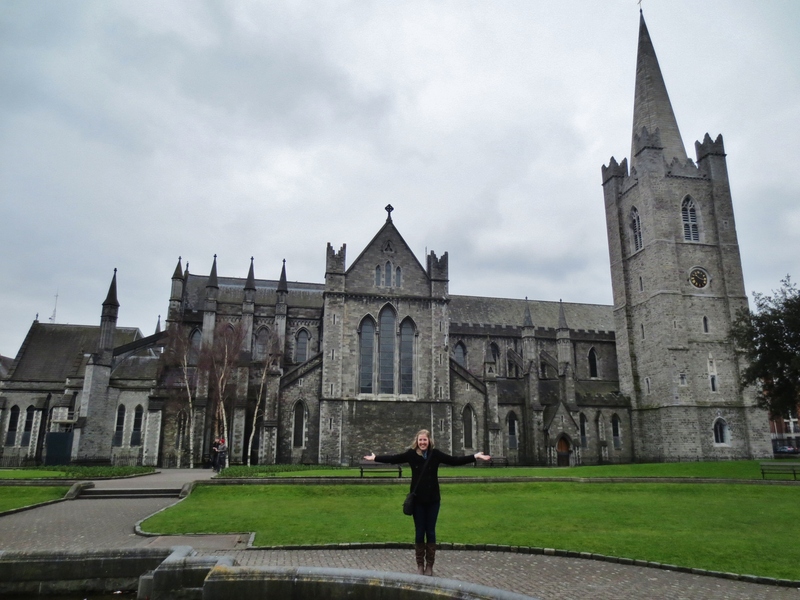 We landed in Dublin and took the city bus from the airport to our hostel. After getting a little lost, we finally checked in to our hostel before heading to “The Bleeding Horse” and enjoying a burger and a pint. 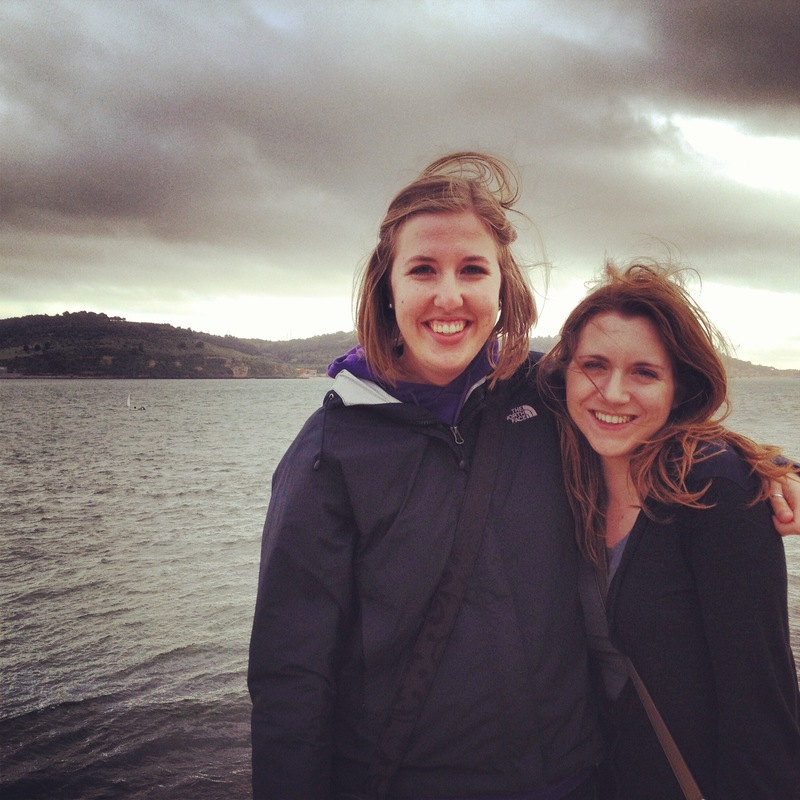 Courtney and I both have Irish heritage and it was neat to be able to experience this city together! 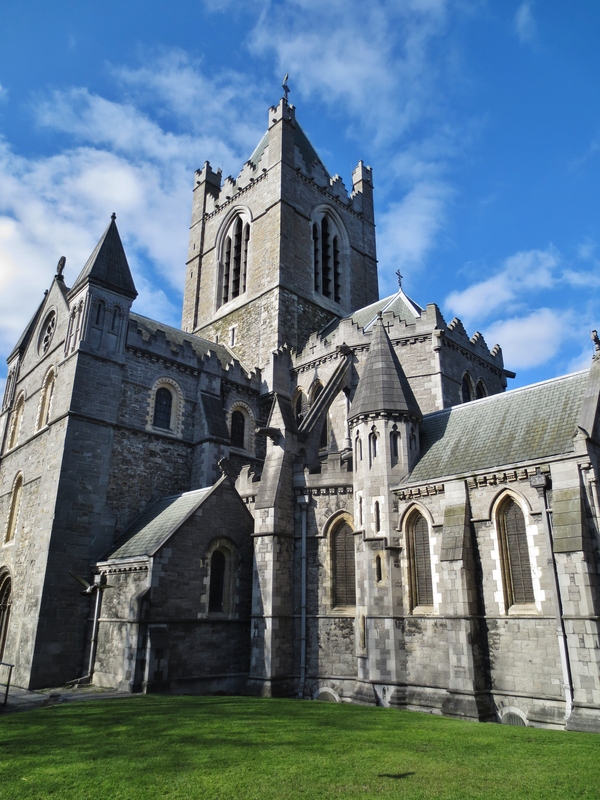 Sunday morning we started off the day with some delicious homemade pancakes at our hostel and then made our way to St. Patrick’s Cathedral. After exploring we came to the conclusion that the outside may be prettier than the inside! We wandered and found a small café where we enjoyed a cup of coffee before walking past the Dublin Castle (it was under construction so we could not explore) and finally making our way to Trinity College to view the Book of Kells, an ancient manuscript written in Latin of the four gospels of the New Testament. 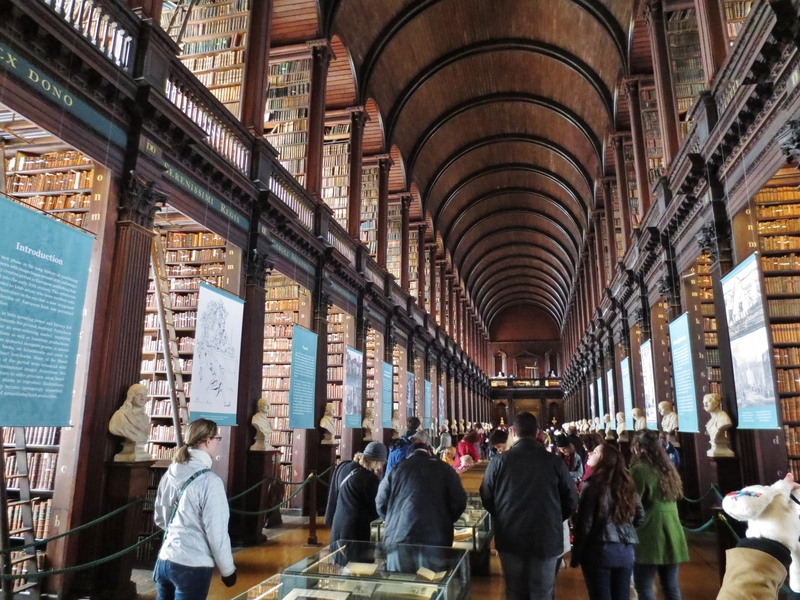 Unfortunately we could not take any pictures, but we were able to snap a few shots of the Old Library at the college. 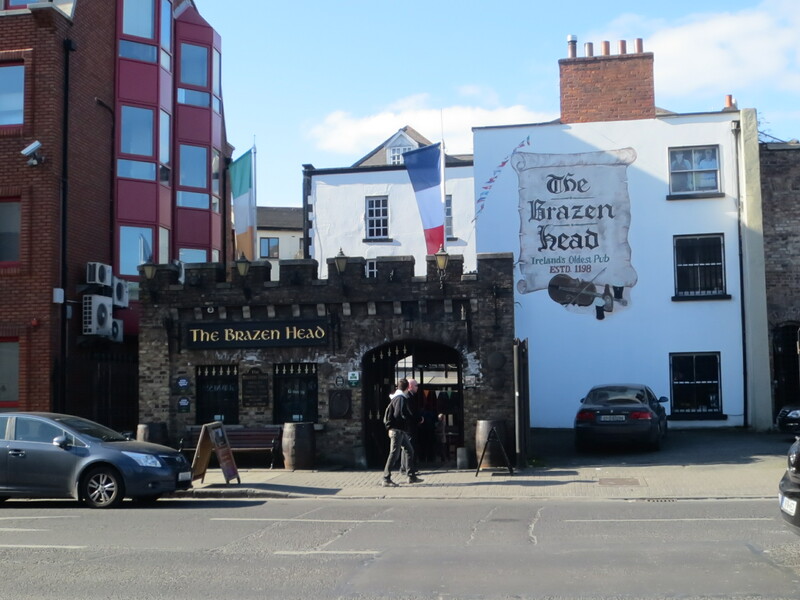 Upon getting lost on our way to the Guinness brewery, we found the oldest pub in Ireland and enjoyed lunch there. 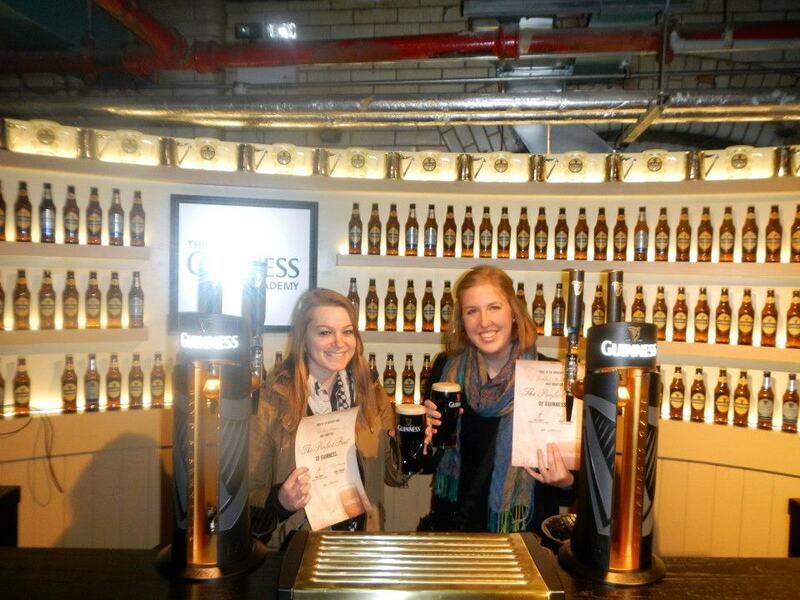 Afterwards we began our tour of Guinness brewery, which is actually housed in the world’s largest pint glass! 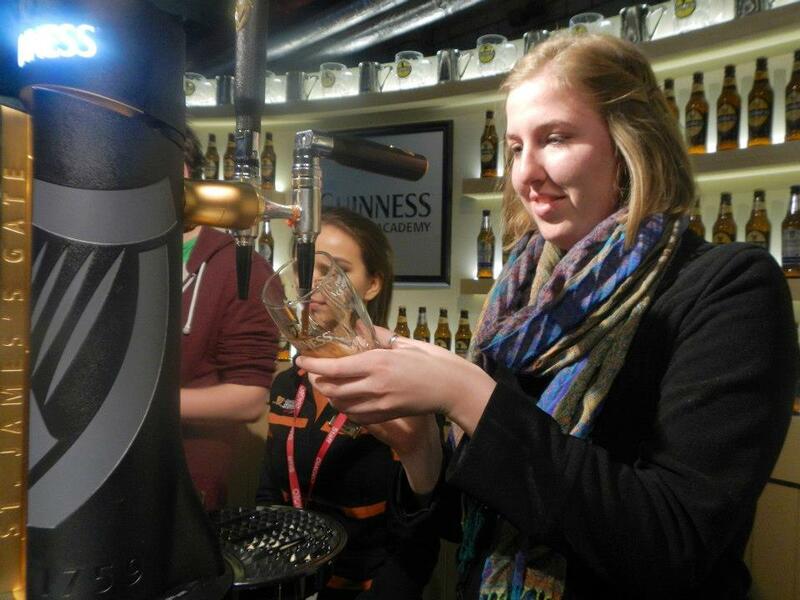 We learned the history of the company, and enjoyed learning how to pour our own pint of Guinness that we were then able to enjoy on the seventh floor “atrium” bar that provided stunning 360 degree views of the city of Dublin. We made our way back to the hostel and stopped to buy a chocolate cake that we then enjoyed in celebration of Courtney’s birthday. We went out for dinner and one last pint on Grafton Street to wrap up a fabulous day in the city of Dublin. 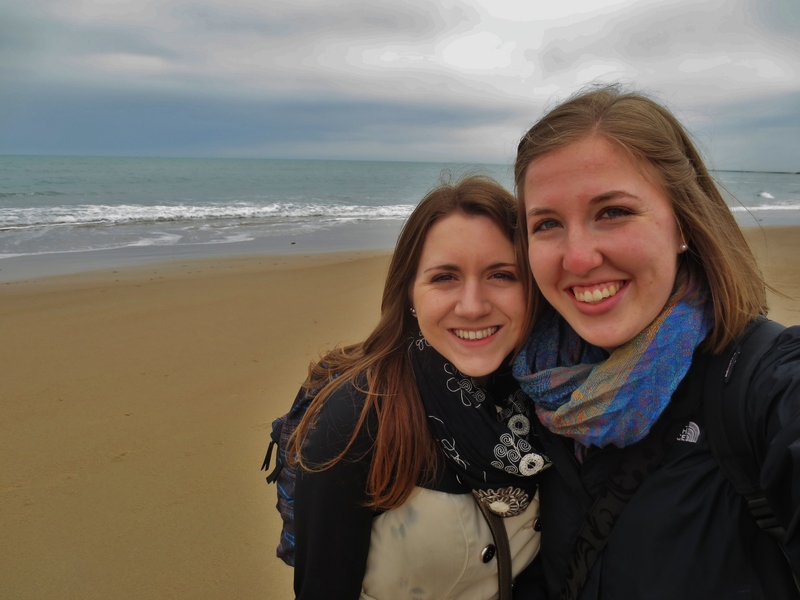 We arrived home around 4:30am Tuesday after spending the entire day Monday traveling and studying in the airport. It was a truly phenomenal weekend, and I am so glad that I was able to share it with Courtney and celebrate her birthday with her. 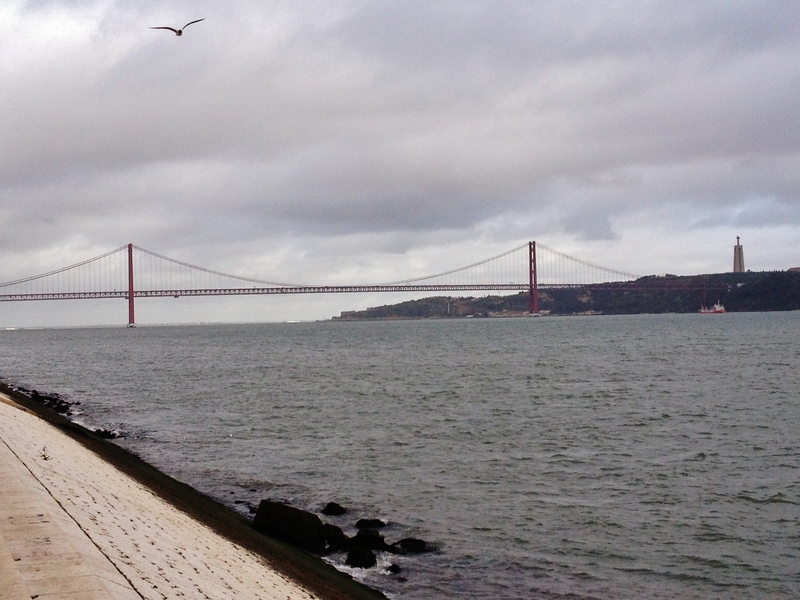 We are spending the upcoming weekend in Lisbon, Portugal! I cannot wait! I hope that everyone is doing well. Miss you all very much! It has been way too long since I have had a chance to sit down and write as well as share some photos with you all. 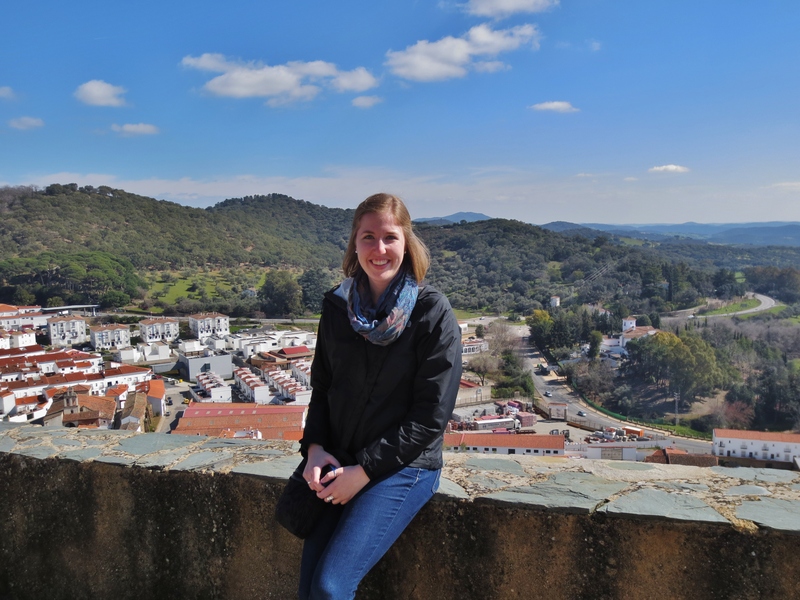 It has been a whirlwind since my last post and during that time we traveled to Cordoba, had our first week of exams, had our first Bible study, traveled to Ronda and Aracena. I will do my best to highlight some of the many things that have happened over the past ten days! 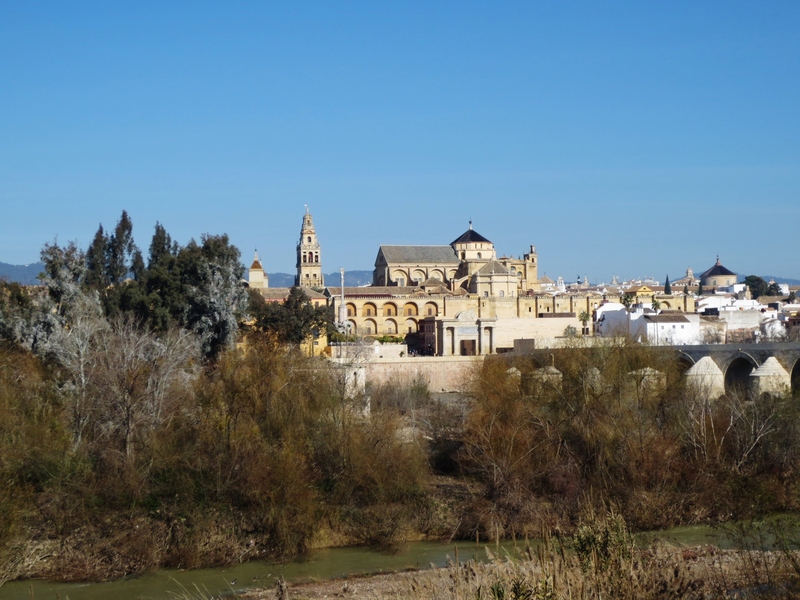 Friday February 15 – Our program took a day trip to the beautiful city of Cordoba about an hour and a half from Sevilla. 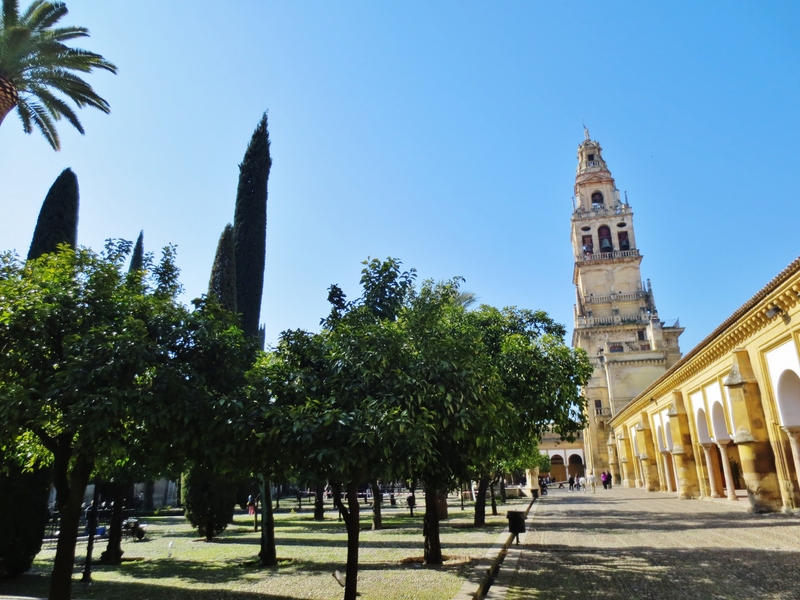 I had been eagerly awaiting this trip as “La Mezquita de Cordoba” is one of the landmarks I have been looking forward to the most during our time here. I was not disappointed to say the least! 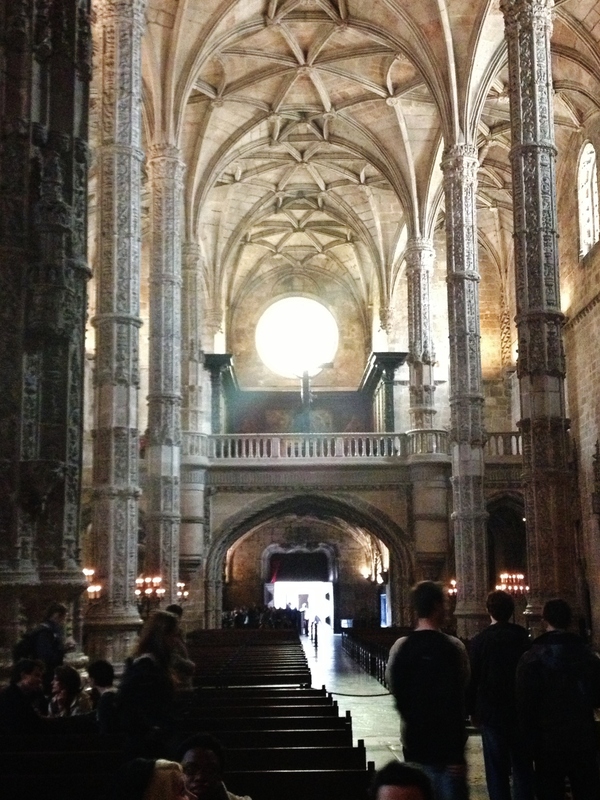 Many of us walked around in awe of beauty of the Mosque that later had a Cathedral built right in the center of it after the reconquest of the Christians. The Mosque is known for its red and white arches that seem to go on forever. 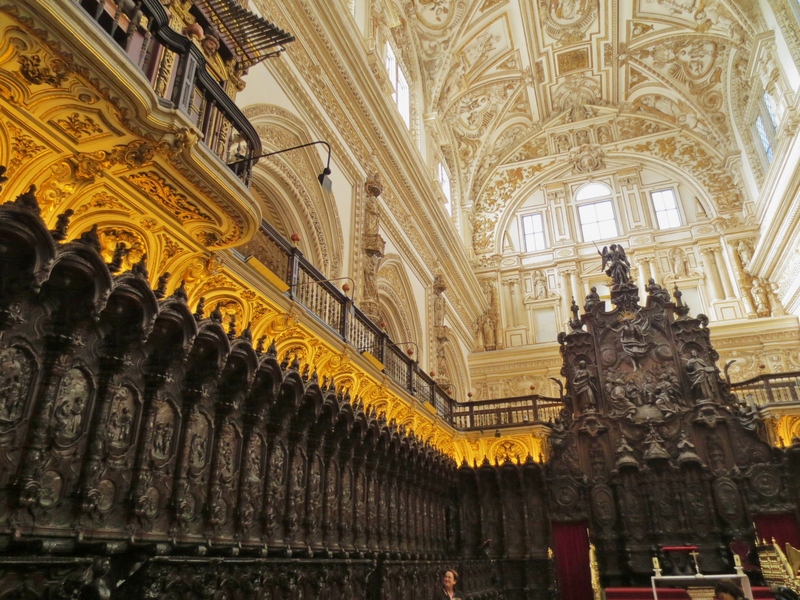 The Cathedral and choir loft is by far one of the most beautiful that I have ever seen! I wish there were words to describe it! 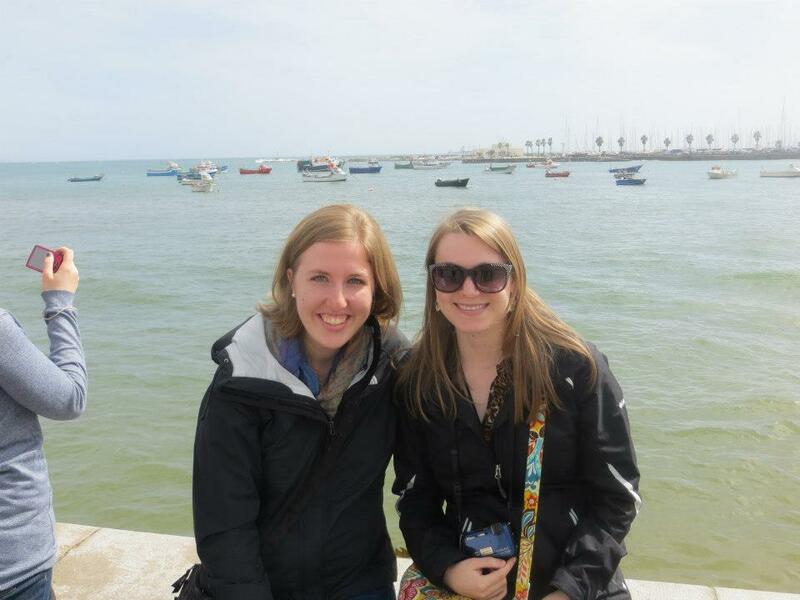 We enjoyed walking around the city and some ice cream during our free time before returning to Sevilla in the evening. 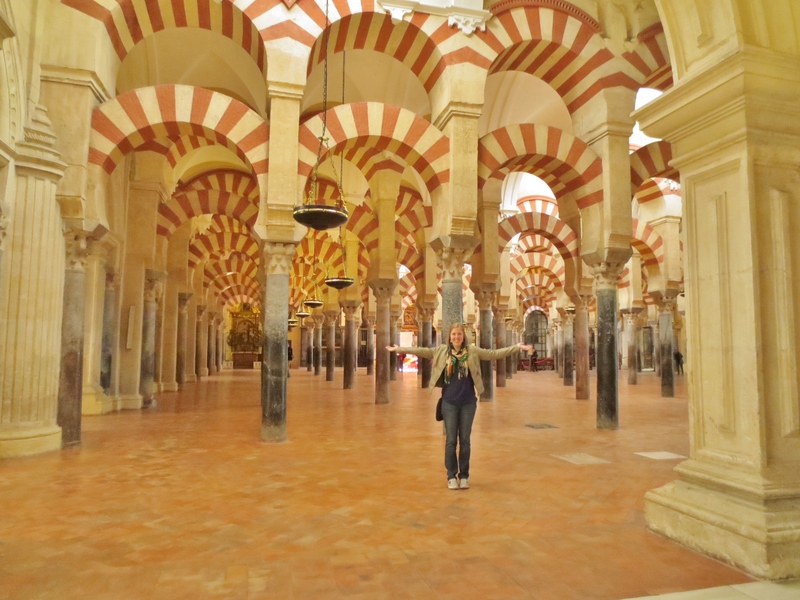 Finally standing among the famous arches of La Mezquita! The rest of the weekend was full of resting and studying as our first exams were the following week and I was battling my first cold during our time abroad. Thankfully Rayas, a wonderful ice cream place in Sevilla opened that weekend and was a definite help in both my studies and time recovering from illness! Thursday February 21 – This was a day full of rainy weather, but marked the end of exams and our first Bible Study get together. We had such a great time getting to know each other over a wonderful cup of cafe con leche. I am so thankful for a group of people that I can turn to for support and encouragement during this journey of being abroad. Friday February 22 – This was definitely one of the best and worst days all combined in to one! 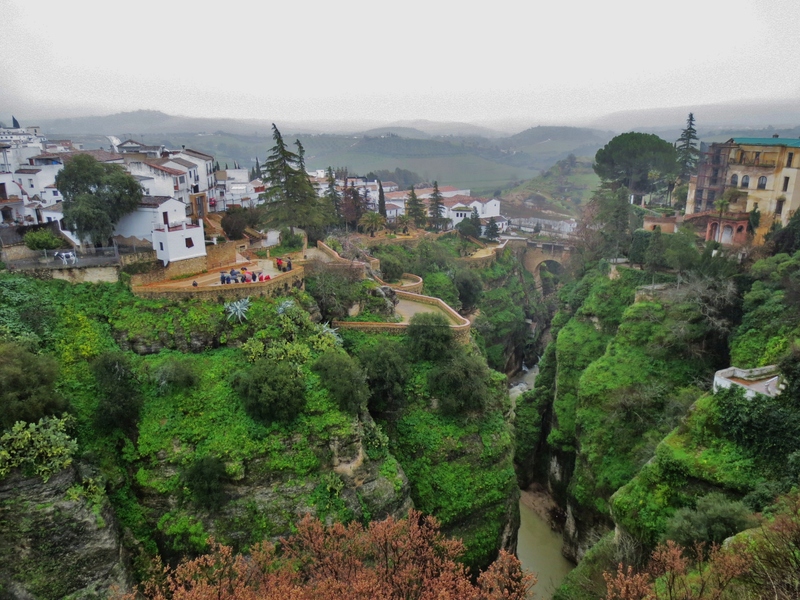 We took a day trip to Ronda with our program. It rained almost the entire time that we were traveling and during our time in the city. We were absolutely drenched and so cold! 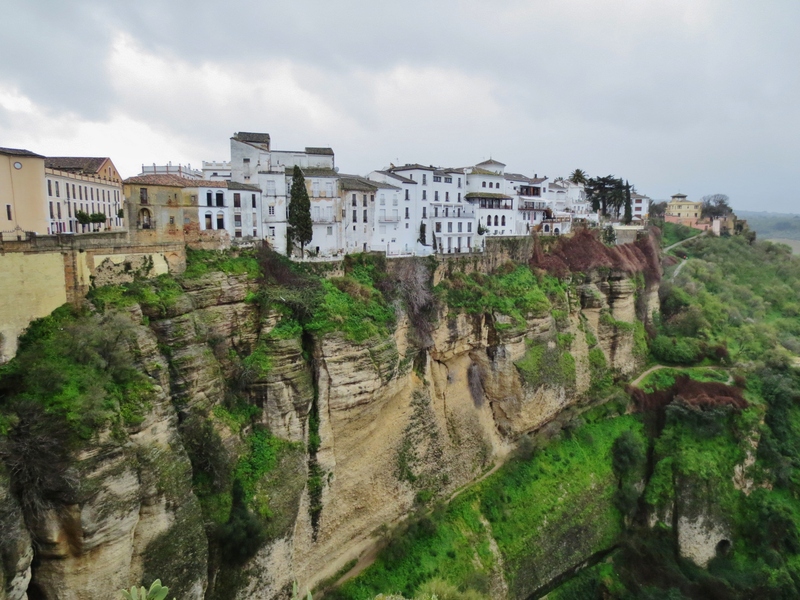 Despite the poor weather, Ronda is by far one of the most beautiful cities we have seen. 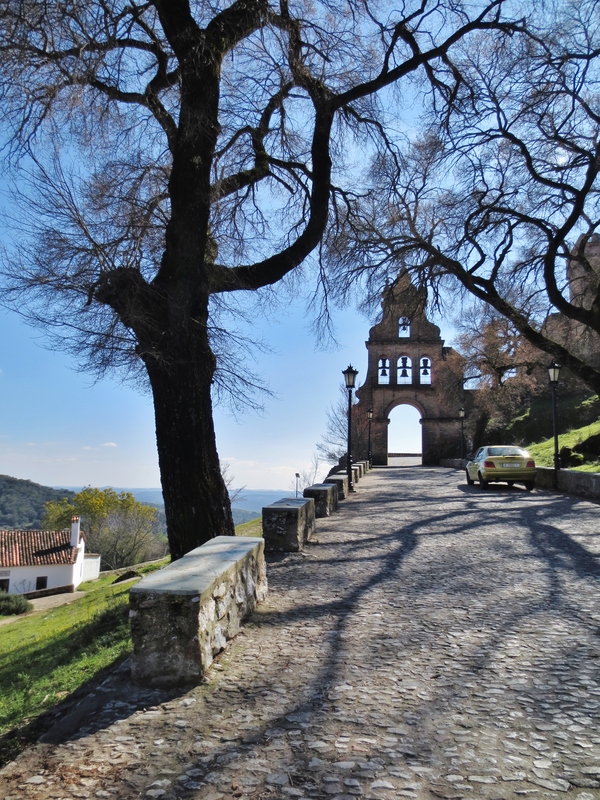 It is in the mountains and the drive there is full of beautiful Spanish countryside. Courtney and I enjoyed what was definitely the best cup of hot chocolate yet (it may have been because we were SO cold!) and looking back we can laugh at how funny the weather was and how absolutely soaked we were! 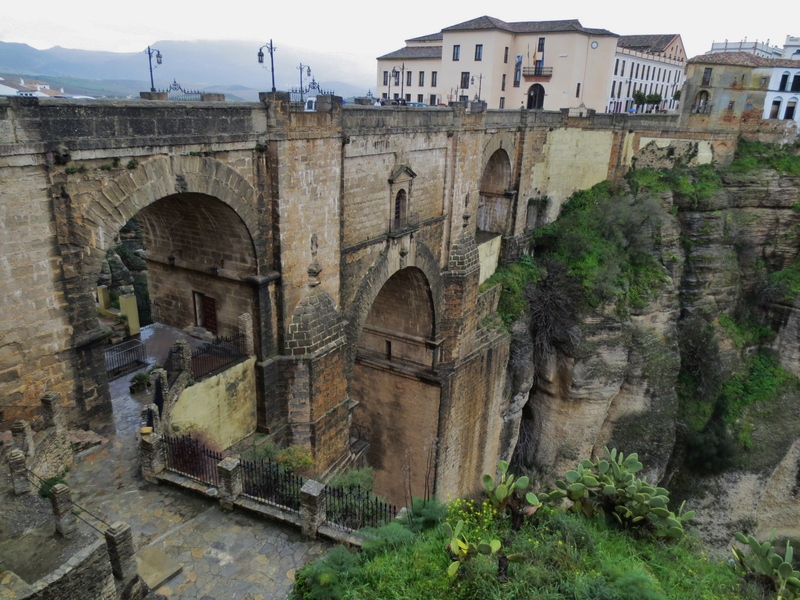 After spending the day in Ronda, we came home and dried out. That evening we went to have some tapas and one of the bars that we were able to attend, El Rinconcillo, is the oldest bar in Sevilla. We enjoyed some delicious croquetas and wine. 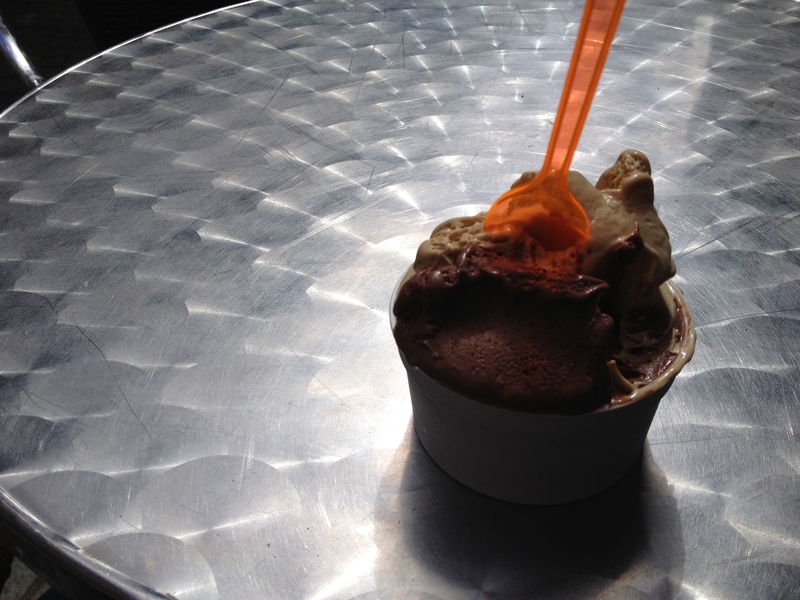 And of course our last stop of the evening was Rayas to enjoy some more delicious ice cream! Saturday was finally a day full of sun. We did some walking throughout the bus station and decided to buy bus tickets to a small city called Aracena for the following Sunday. Little did we know what a treat we were in for! Sunday we boarded the bus at 9 in the morning and drove for about an hour and a half to reach the city that was literally in the middle of nowhere! The bus ride was absolutely stunning, and Aracena is a small, typical Andalusian city with white-washed houses and buildings. 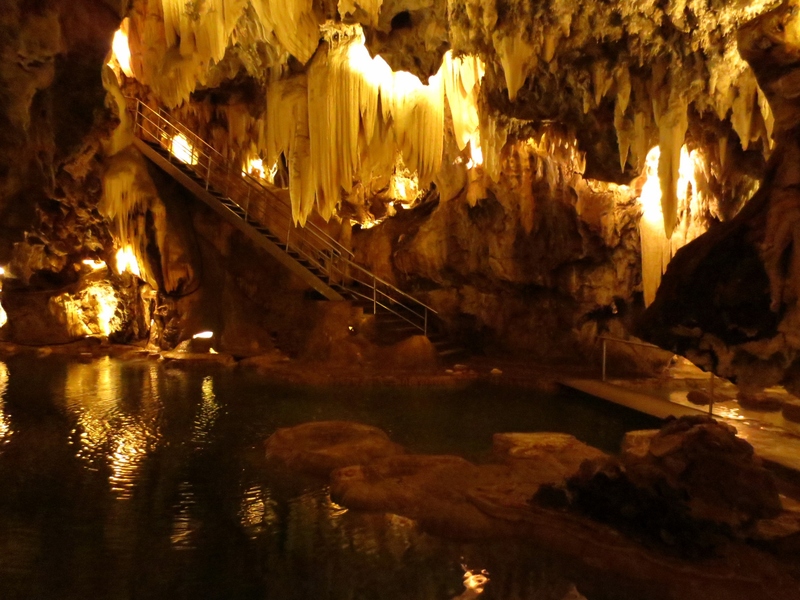 They are known for “La gruta de las Maravillas” which is a huge cave in the city. They are also known for their Iberian ham, and yes we even went to a Ham Museum! 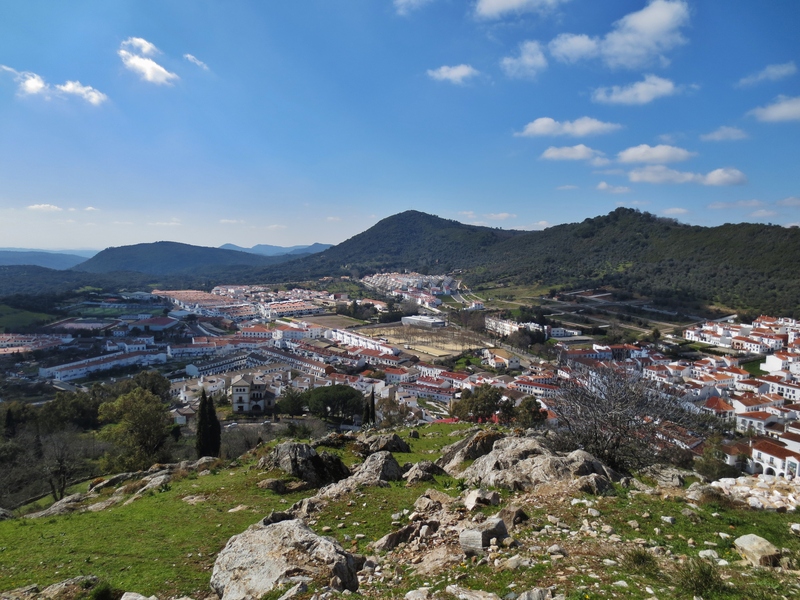 During siesta time when many of the local businesses are closed, we climbed to the highest point of the city that is marked by a beautiful cathedral and stunning view of the countryside. 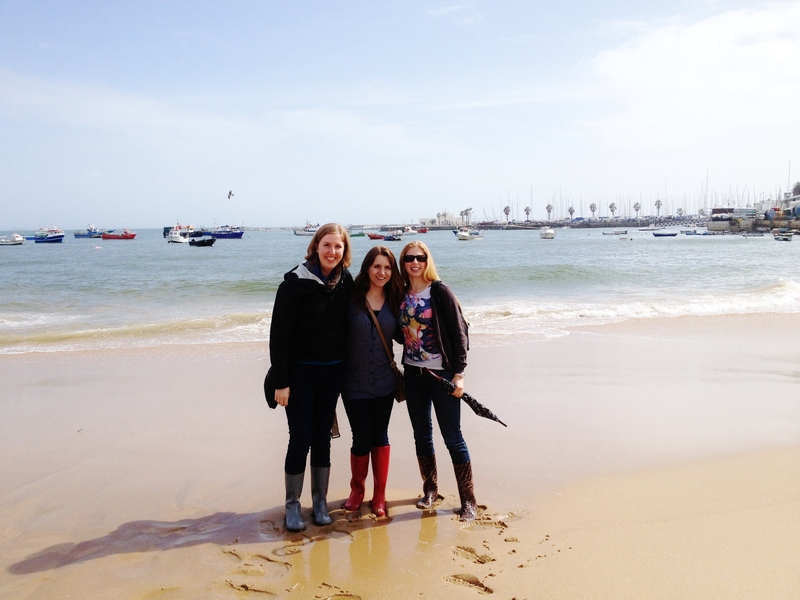 This may have been one of the best days yet in Spain! 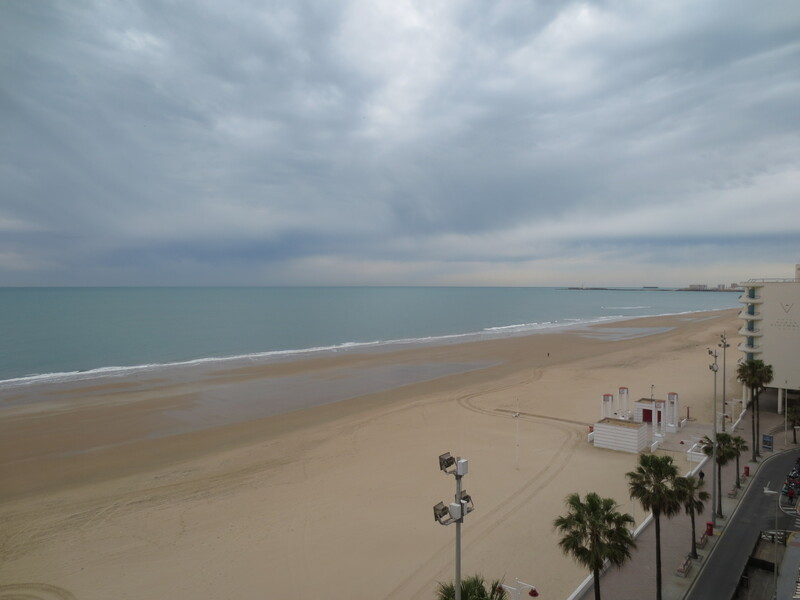 … and this was the view! This is a short week with only three days of classes, and then Courtney and I embark on our adventure to London and Dublin this weekend! I hope that everyone is doing well! Miss you and love to you all!! My heart is so full today and I just have to take a moment to write and share with each of you some of the small things that have made this week a lot of fun! For those of you who don’t know, Marcela is the name of my friend, mentor and “second Mom.” In fact, she is one of the biggest reasons that I am here! Over the last ten years Marcela and her husband Duane have played a huge role in helping me become the person that I am today. Their friendship has been such a blessing for my entire family and it is truly an honor to be able to use her name for the next few months during my time here. 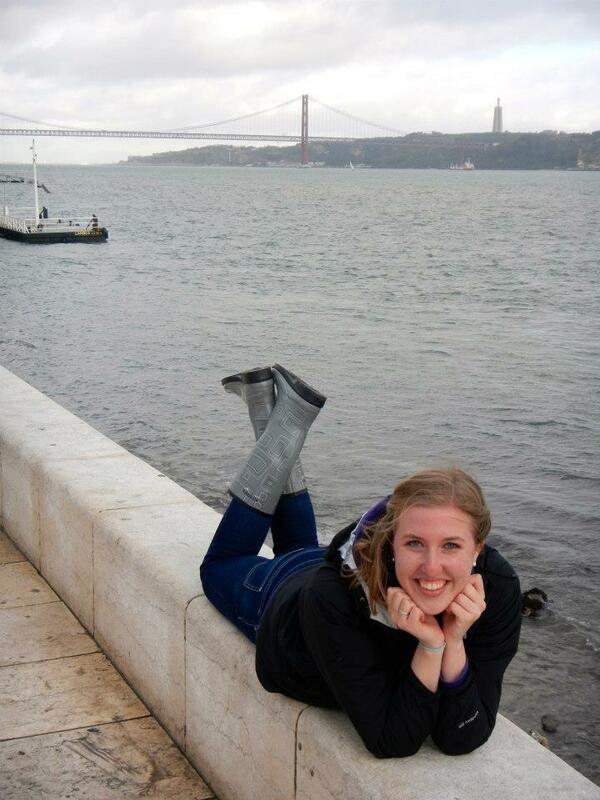 In April I get to meet her family for the very first time and spend a week with them in the Galicia region of Spain. I can’t wait!!! Today Courtney and I decided to surprise Charo for Valentine’s Day by buying her a small cake for dinner. Charo is a widow of three years and constantly talks about how in love she was with her husband. I hope that I can have the kind of love that Charo had with her husband someday in my own marriage. While we were buying the cake, we ran in to one of Charo’s close friends and we told her about the small surprise we were planning. She told us how Charo talks about us as though we were her own daughters and how happy she is to have us in her home. What a blessing!! Charo was so surprised and gave us each a big hug. We enjoyed the cake with dinner and we laughed so hard that my stomach hurt afterwards. It is so rewarding to be able to communicate with Charo in Spanish and be at a place where we can all understand each other and laugh until we cry. I love it here! 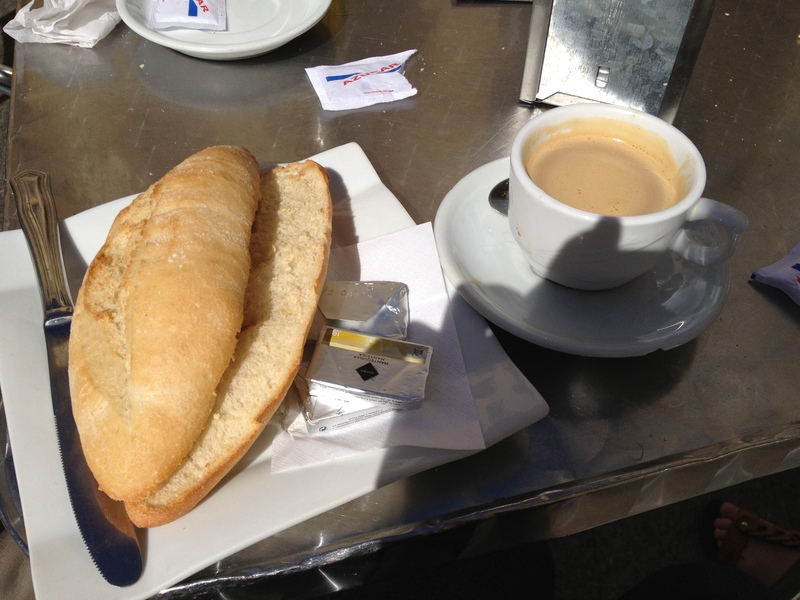 I am off to have un cafe con leche (coffee with milk) with my wonderful friend Meryl. Tonight we are working on plans for our first Bible Study and hoping to start next week! Please pray that God can work in amazing ways through this group. I am excited to see what He has in store!